We are creatures who like privacy and autonomy. 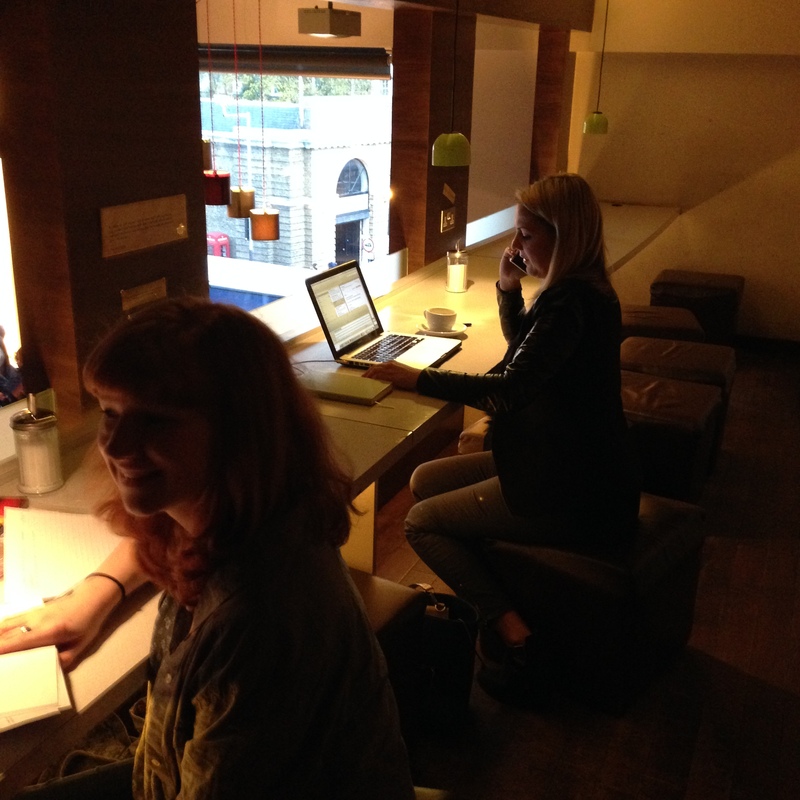 We like to have bounded space when we sit down to do individual work, demonstrating the clear line between what’s mine to use and what’s yours to use. We appreciate not having to fight someone’s elbows or stage our things elaborately to maintain a respectful distance. Successful space planning accounts for this, and carves out spaces that are at least hinting that, while seated at them, you can pretend that you’re alone and not sharing space. Do we hate sharing space? Maybe it’s just that the rules are clearer with spaces like the one pictured above. It’s small, yes, and it’s not the most comfortable, but it has everything you need: a place to put your backside down, a flat surface to rest your elbows, computer, or book, power, and, nicely, a view. It’s facing away from other people, from the traffic directly behind you. Once seated, you assume the don’t bother me stance. 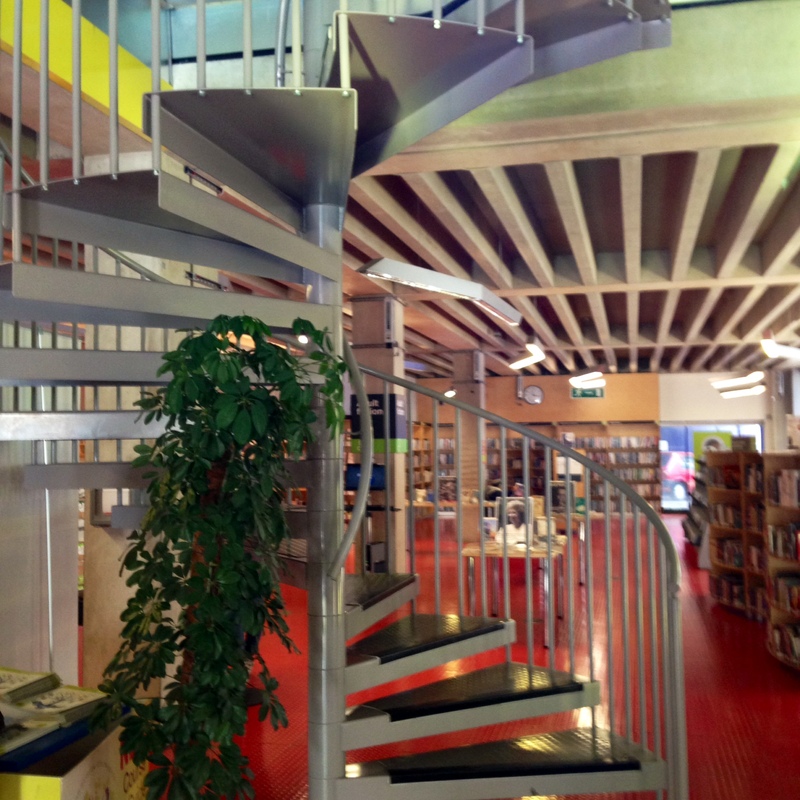 This space is in the Library Store Whitechapel (which is, let me underscore once again, amazing). It’s one of many like it, and this was the only one I could find that wasn’t occupied. The rules of this seat are fairly obvious: it’s empty, take it. You don’t need to answer to anyone. Do as you will. I must say, coming from Canada, I was really surprised to see such a tiny space. 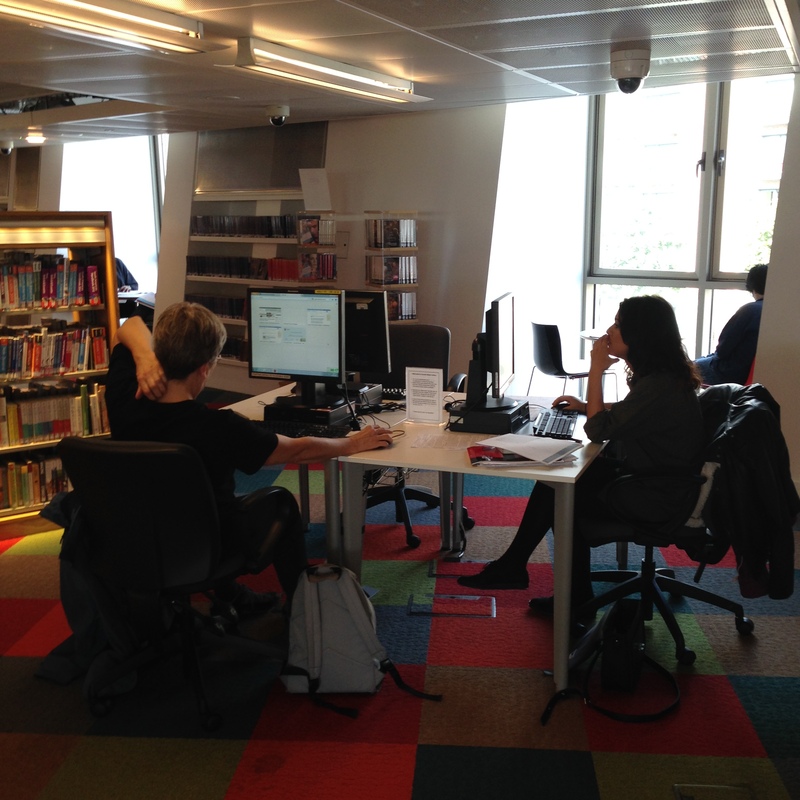 It really goes to show how lucky we are when it comes to space; the US study space standard seems much bigger to me, but this is what patrons in London are happy to find. While it seems obvious to anyone that human beings tend to prefer individual spaces to shared ones, I think the story is quite a bit more complicated than that; as a culture, I think we actually love shared space, as long as it’s well-designed and accounts for our needs. How else to explain why some spaces (like libraries) are often packed, but computer labs nearby are empty? If no one’s in them already, no one wants to be in them. at the UTM library, we have students sitting on the floor in the library, together, while computer labs in the building next door sit open and entirely empty. People tend to like to be where other people are, but like to maintain their own sense of space and autonomy while there. That’s the fine line we need to walk when considering spaces for people. 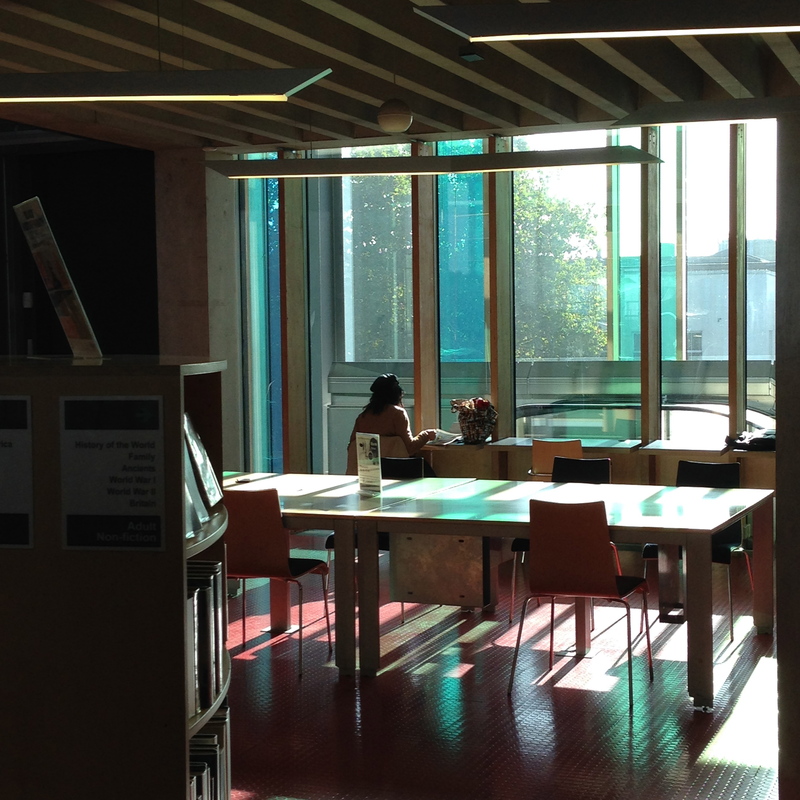 This is a study area in the Canada Water library. There are, I think, some fatal flaws in the design of this library, but you can see all the attempts to make it more user-centered and thoughtful. 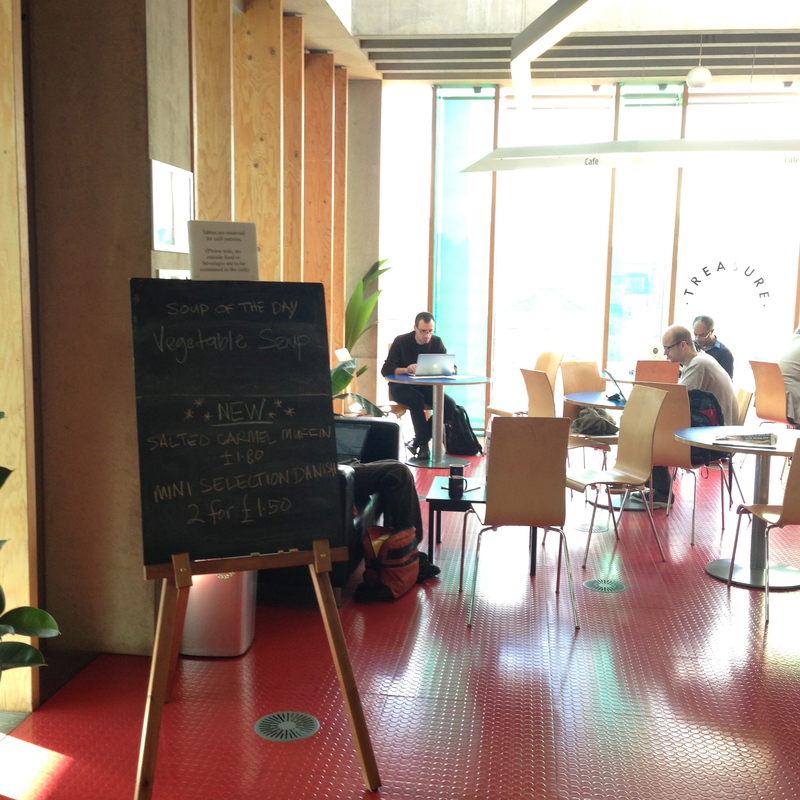 These study spaces are one of those thoughtful pieces, even though there are some critical problems with it. The study spaces are simply a long ledge built into the wall along the very top level of the building, looking over the collection. Again, the posture you assume seated at this study area is don’t bother me. You’re facing out, not inward toward your neighbours or toward anyone coming up the stairs. You are looking outward, there is a sort of visa in front of you, and you are winged on each side by spaces doing the same thing. I really like this approach. 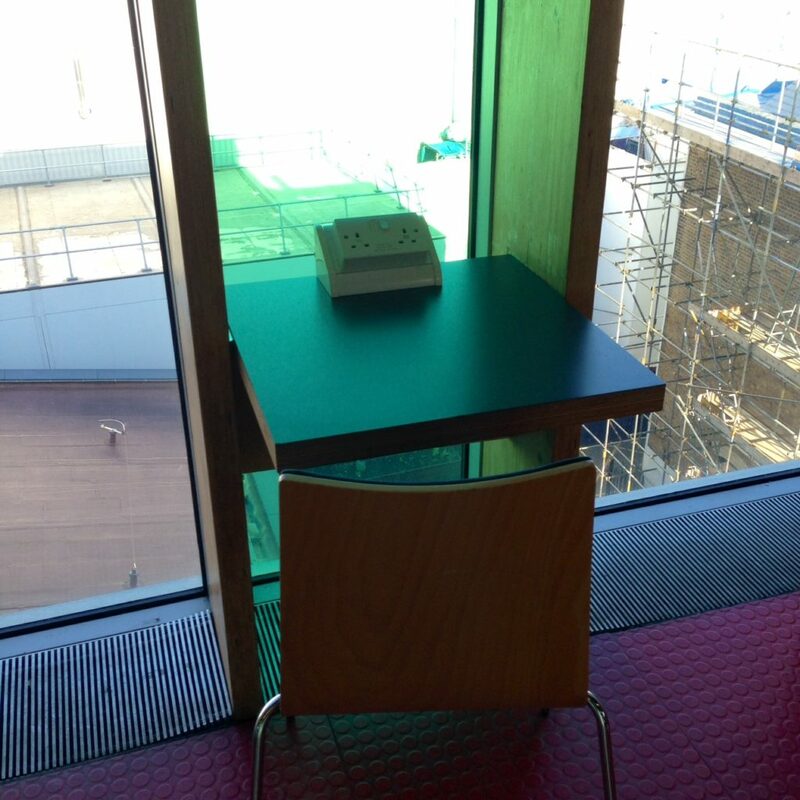 I think it tells you that it’s a silent study area without you having to articulate it in words. 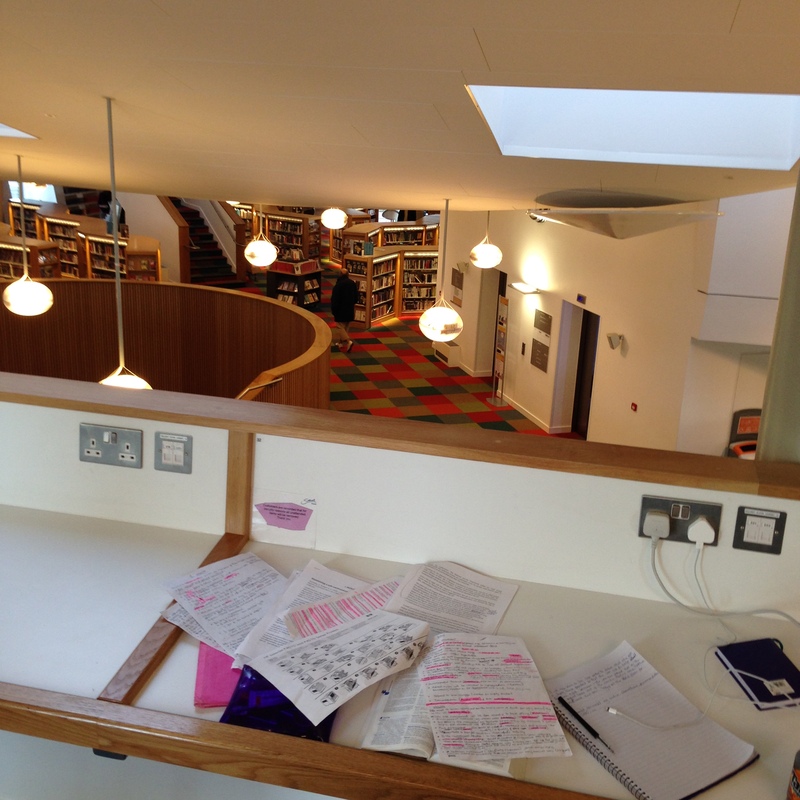 What’s also interesting about this study space is the absolute lack of barriers between one study area and another. I’m not sure what to think of that, but I could see, walking through this area (it was very hard to find a place to get a shot of it, because it was packed) that everyone respects that tiny strip of wood that marks the line between your space and my space. Barriers would make the space uglier, and I’m not sure whether or not patrons would appreciate them or not. Those might be one of those things we feel like people want, but maybe they don’t. The patrons who use this space will use it for shorter spans of time than, say, a staff member seated at her desk day in and day out. The privacy needs here might be lessened because of that. It might be that all you need is to designate the line so that no one fights for space. As I said, this area was very popular. 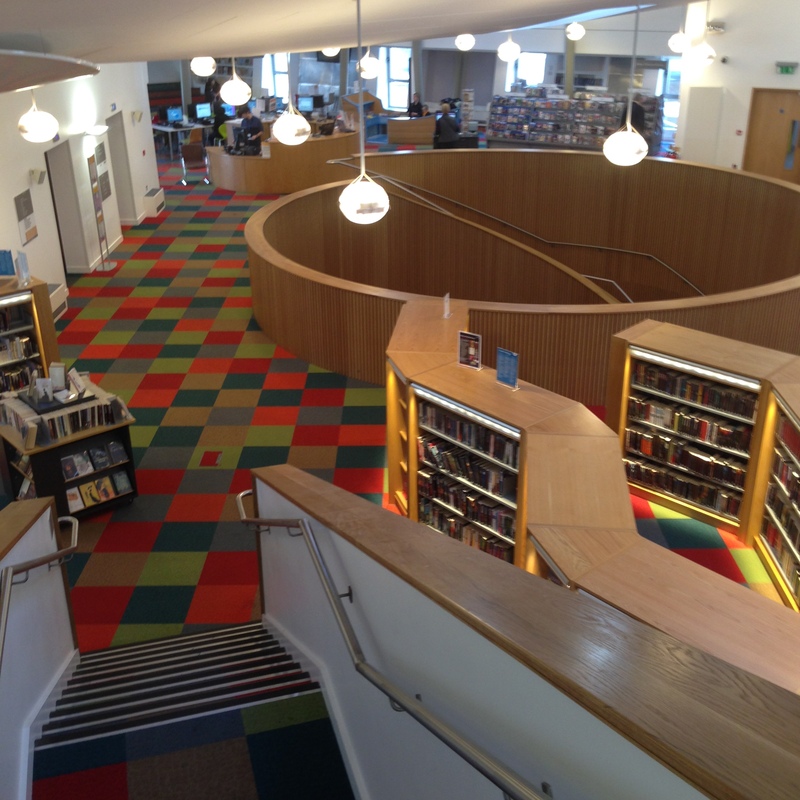 It’s fatally flawed, though, because the area below, quite bizarrely, contains the children’s library. So they have children’s programs going on underneath the noses of a bunch of students doing their homework. Not ideal. But I think study areas like this overlooking collection spaces could work really, really well in areas where that collection space is not a noisy location. This is a really difficult library to photograph, but as you can see here, the band of wall above hides the study space that ring the whole floor, all facing outward, and there’s low collection and tables below. I suspect if it weren’t for the children’s area, this set up would work well. I love how tucked away they are. It seems like the perfect teen homework zone; it’s a cozy nook at the top of the library, it’s got a view peering down at the rest of the world going about their business, keeping it from being lonely and depressing. 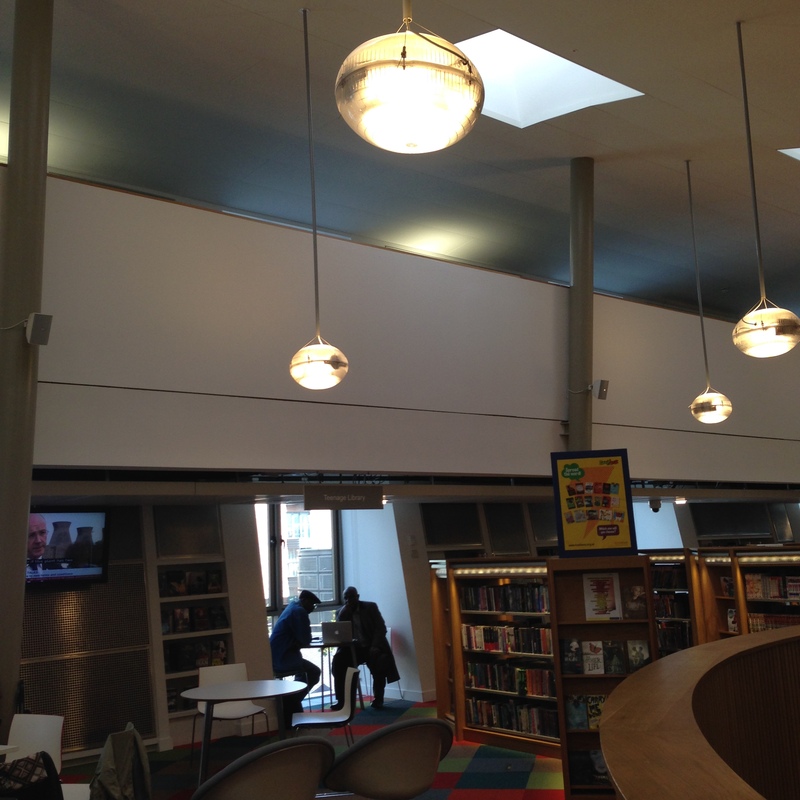 There’s power outlets, and at the first floor, at the centre of this library, a full cafe, the smell of which drifts up to the top floor. (That seems like a mistake and possibly a problem with the A/C, but when it’s cookies and coffee, it’s kind of an interesting design choice, really.) Teens and cats; both apparently fans of hidden, high places with a view. 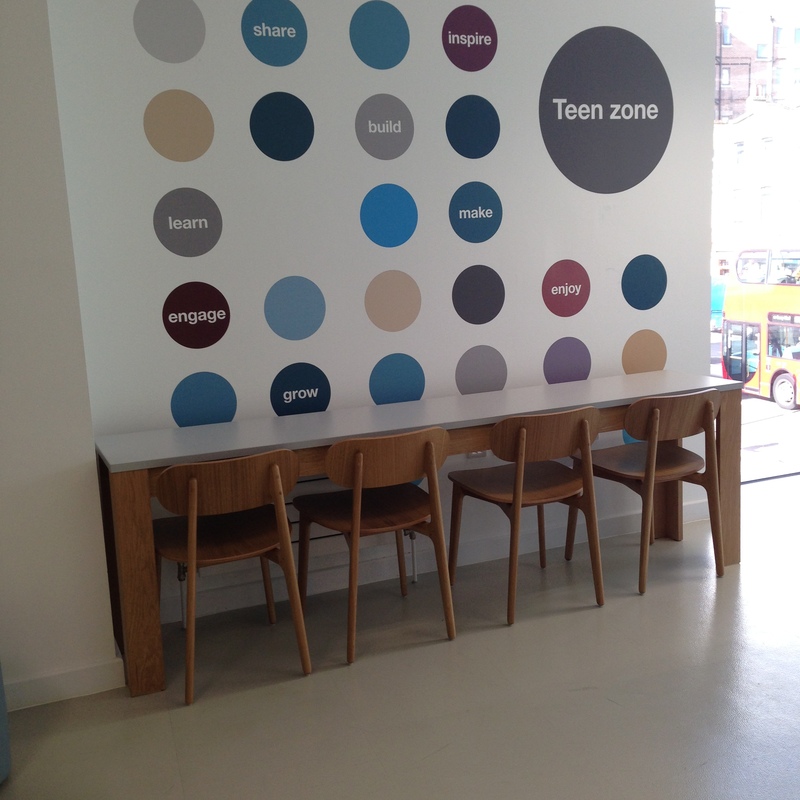 Another, less successful teen study area. I say less successful mostly because I was able to take a photo of it. (I try not to get patrons into photos as much as I can, though I am always taking these pictures with the permission and full awareness of the library staff.) This space is in the new Idea Store Watney Market in Shadwell, which is a short walk from the Whitechapel branch. This branch is nowhere near as busy as the Whitechapel Idea Store, but there were a few teens here when I visited. But they were seated in computer area to the right of this area, which looks down into the beautiful glassed-in stairwell, using individual work spaces as communal ones. This area is lovely, with really nice chairs, but the table is too narrow, the space you can take up too undefined, and you’re face is practically pushing up against nothing but wall. You still get the sense that this is individual space rather than collaborative space, but I’d imagine this is the last space that will get claimed. It’s just too difficult to use. Small can work, but it has to be the right kind of small. 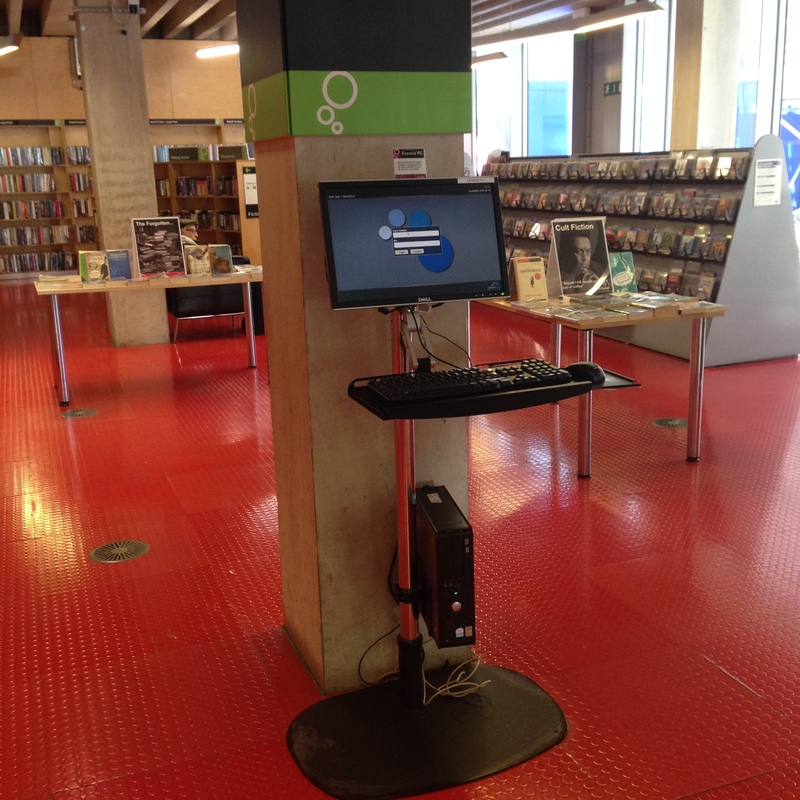 Individual computing, Canada Water library. I’m genuinely conflicted about this. It’s a good use of space, and clearly in use. I like the barrier-free look, but is it comfortable when someone is sitting directly across from you, and you run the constant risk of staring meaningfully into a stranger’s eyes? 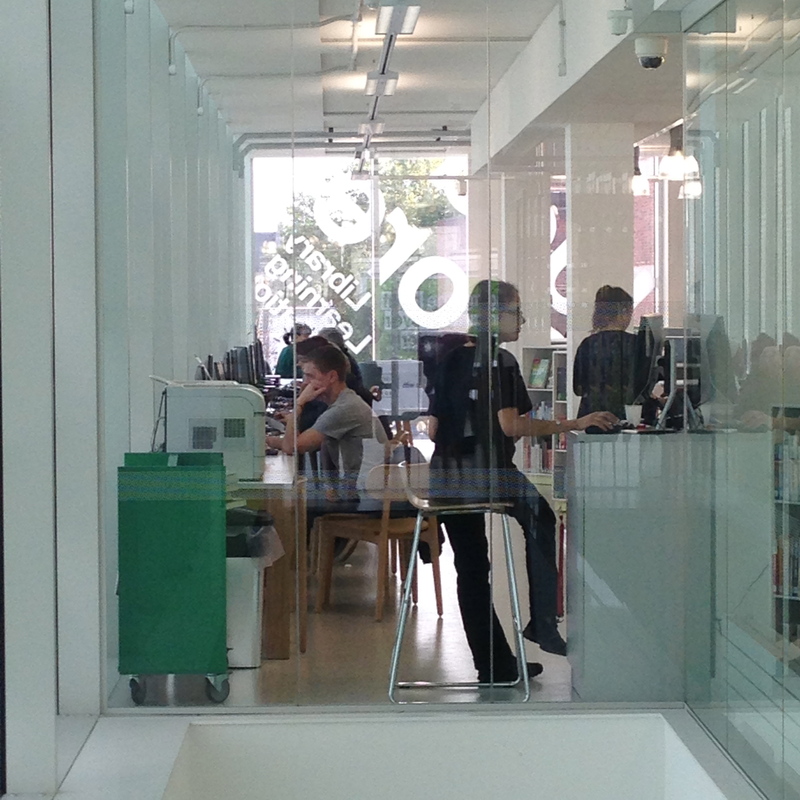 Individual computing, Idea Store Whitechapel. No chance of an accidental staring contest here. Sorry it’s so dark; it was a beautiful, bright day. As you can see, once again, it’s a small space you get to claim, by North American standards. There isn’t a lot of room to spread out. But, thoughtfully, these are spaces for spreading out. 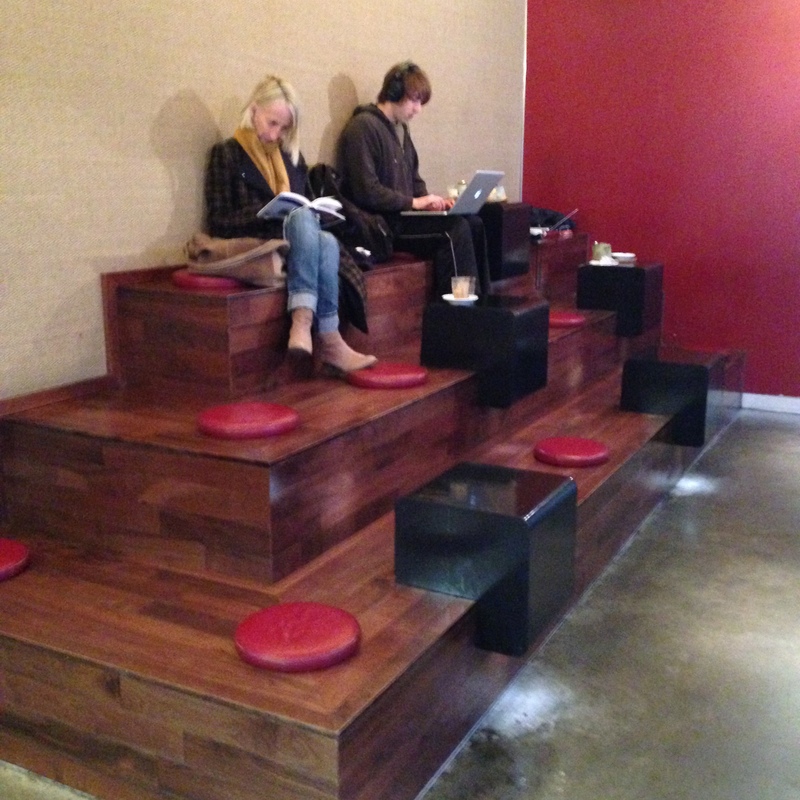 These are spaces for sitting in front of a computer, not for laying out an outline or working with books. I appreciate the varied approaches to respecting that difference in that activity. Not all spaces need to conform to all needs. Also, thoughtfully, this is a space that looks outward, underscoring the individual nature of the work they expect will go on here. I’d worry about glare, but to be fair, this isn’t the sunniest country in the world. I say that with affection. What I remain deeply interested in is the other ways to create individual spaces, the more challenging ways. I genuinely don’t know if this will work, but history says it has worked in the past, and there seems to be a kind of pendulum-swing in attempts to bring it back. The communal table. 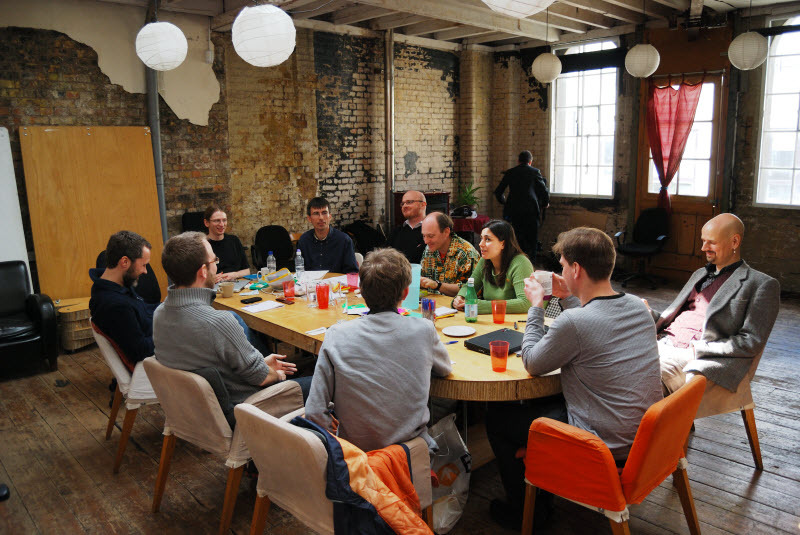 Most shared tables look like this one at the Idea Store Whitechapel. Notice there’s suddenly a lot more room per person; when you’re sitting at a table, you need to designate more room to make people feel more comfortable sitting there on their own doing their own work. 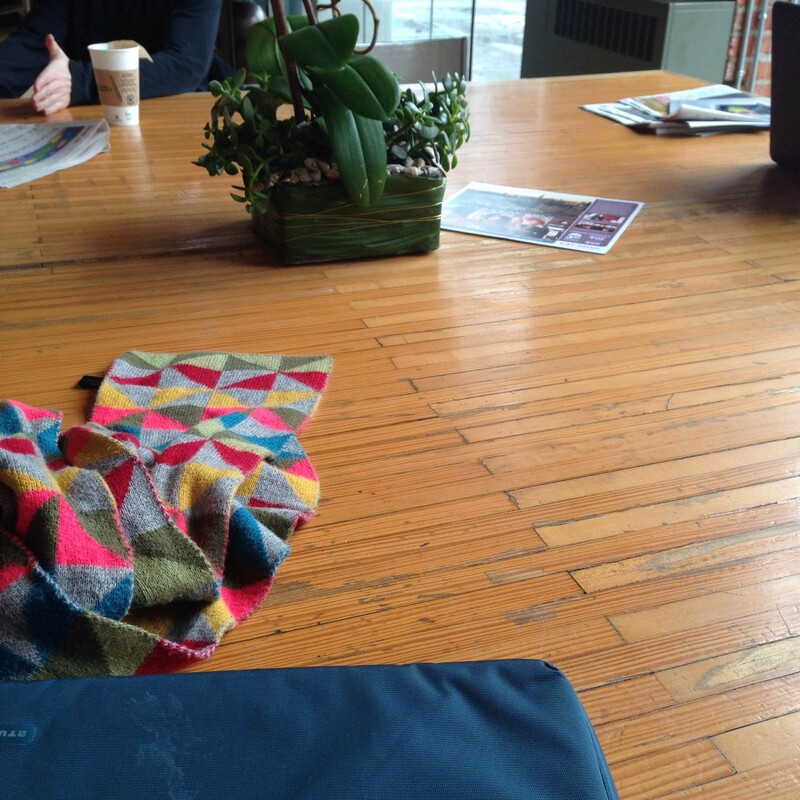 This still isn’t a collaborative table; the chairs are too far apart. Notice the only patron in this area chose the narrower table that’s looking out, more easily self-defined. We used to get a look of mileage out of reading rooms. In my own experience at UTM, reading rooms can quickly turn into cafeterias, shouting, pizzas and all. Is there still a place for these kinds of shared tables? 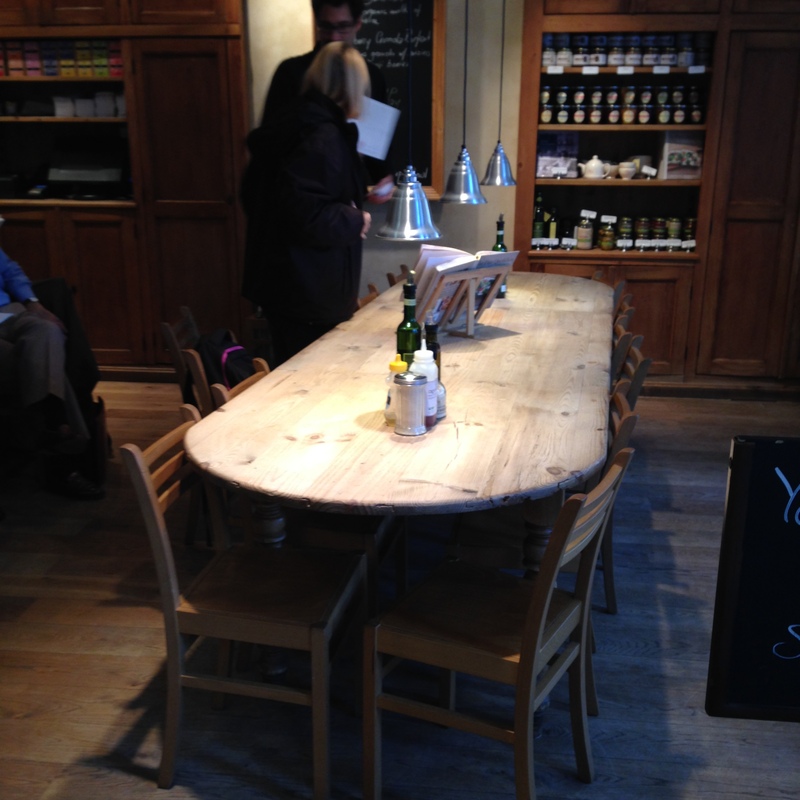 This is an advertised Communal Table in a bakery/café in Hampstead, just down the road from my flat. It’s never for one party, it’s always for individuals or pairs who end up sharing a table like a family. 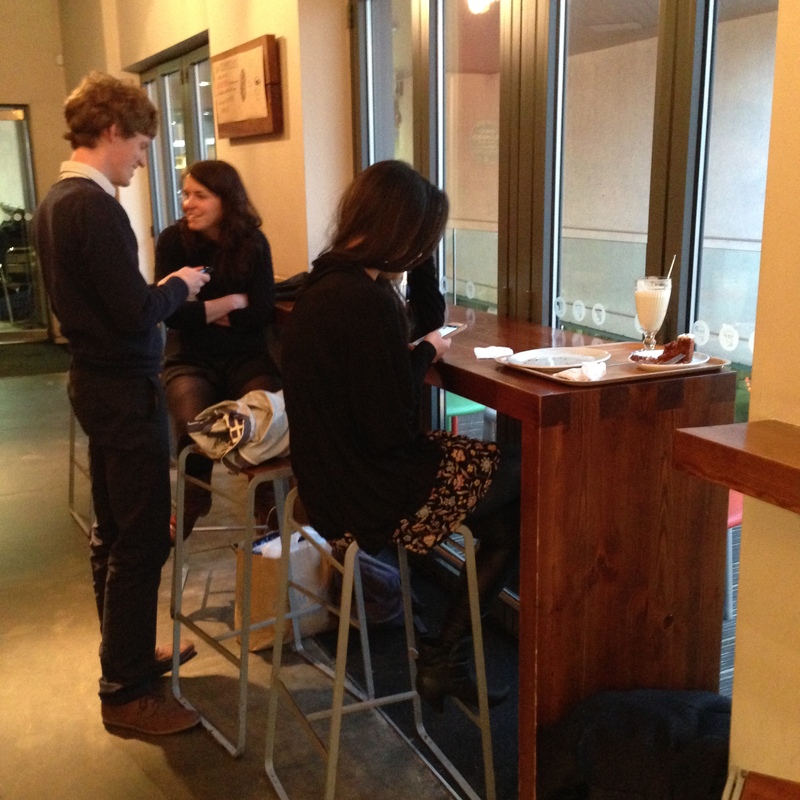 The staff facilitate this by seating you there, which takes away some of the awkwardness. It’s not designed for small groups, though; it’s designed to get strangers to interact with each other, if they’re willing to. Or not; sit and have your coffee, read a book. But you’re part of a greater whole when you sit here with others. You’re part of a community. 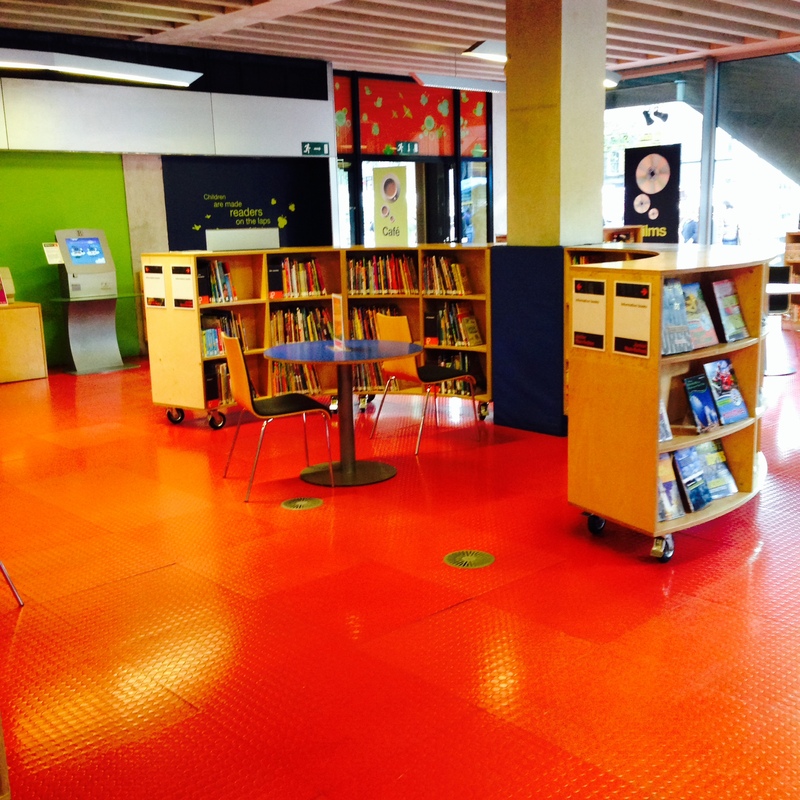 Because of the wide variety of activities that take place in a library, libraries need to contain a wide variety of kinds of space. Individual work space that shows in its design that it’s for individuals studying is critical; but keeping it somehow connected with the life of the space going on around it seems key. Large shared space seems to be coming back, perhaps in part because it’s more flexible. These shared tables can work for individual study, or for collaborative groups of all kinds, depending on need. I’m looking forward to seeing more spaces that fit into this spectrum. I’d heard that Marks and Spencer had some interesting computing set ups in some stores, so I was keeping my eyes open for them I finally stumbled across one yesterday. It’s quite something. It’s three stations; one, a proper workstation, very slightly reconstructed to function as a pubic terminal (in the middle, with the attached keyboard), and two computers set up to look like giant iphones. 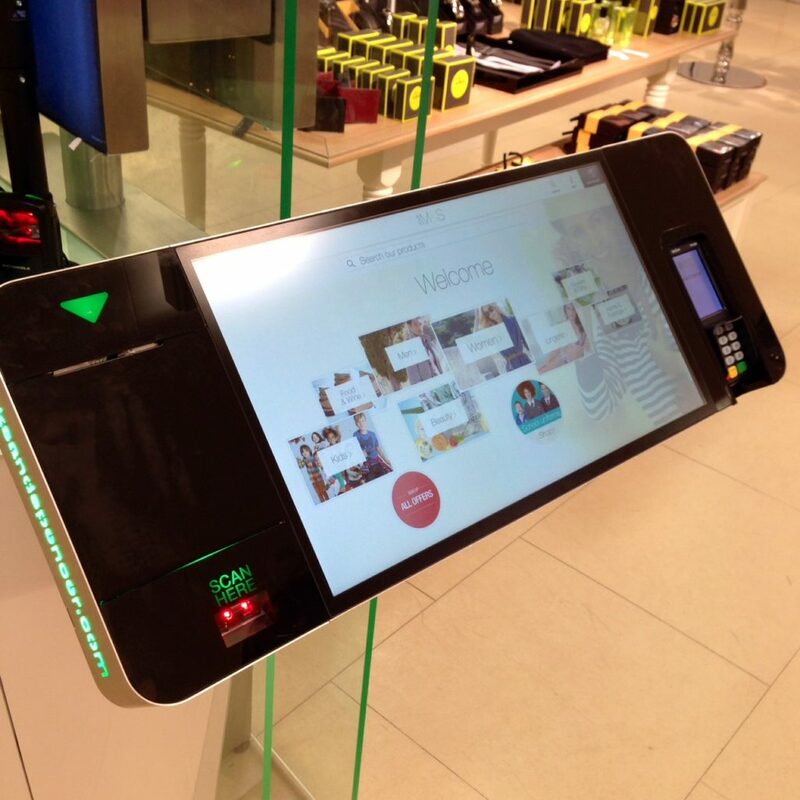 Giant iphones on which you can a) scan through everything you can buy from M&S, which is a lot, b) scan the barcode of a product you have in hand at the store, and b) order products and pay for them on the device using your credit card. 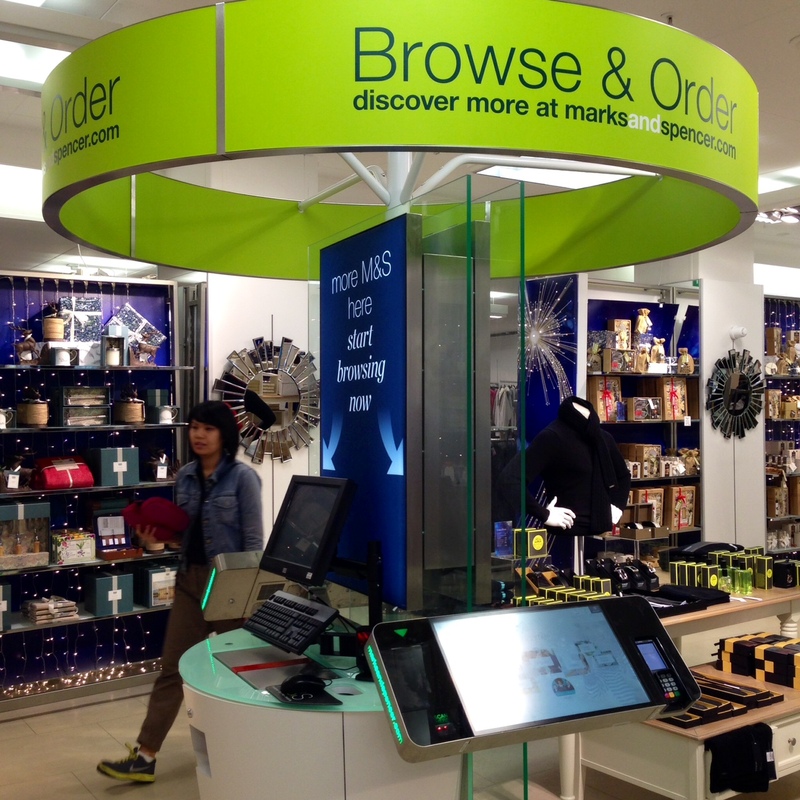 What M&S is doing here is pretty analogous to what we do with computing in libraries; there is a collection all around you, but you can access it digitally as well. And, with the barcode reader, the two can interact.These are custom computing devices to help branch the physical and the digital world, and nicely-thought out ones at that. When I first saw it, I wondered if they were trying to highlight the fact that you don’t actually need to come into the store, you can order everything you want online and have it delivered, but I think it’s more than that. 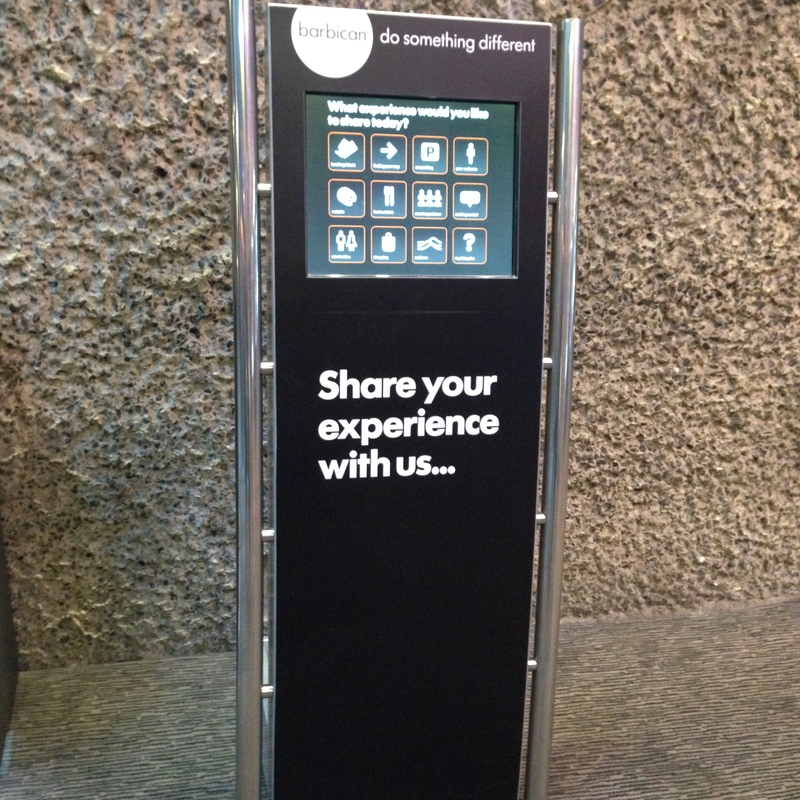 It’s offering a new dimension of service to people who are physically in the building. I haven’t yet seen libraries branch into shifting the metaphor from sitting down at a workstation to an app-like experience like you see here. It might be too early for the general population, but I can’t see why you wouldn’t try, and why it wouldn’t work. Look at the difference between the set ups; the keyboard and mouse seem so clunky next to the slick faux-iphone. I flipped through the options a bit on the touch screen while I was there, and it was very much like scanning through a paper catalogue. It’s a jump ahead in that it’s bringing the digital version of the shop into the physical shop, but it’s also a return to the paper catalogue, just in digital form, with the ability to order without looking away from it. That seems really accessible to me. I’m always interested in how well-considered technology like this works on the ground, and unfortunately I didn’t manage to witness anyone trying to use these. (I might have to go back and watch.) What’s really nice about them is how really approachable they are; it would certainly be easier to use the touch device with a friend or a staff member than the keyboard and mouse set up. It’s lower, it’s pointing up at you, it’s got smooth, broad edges so that people can gather around it. The screen is bigger. The software is clear, simple, and beautiful. It’s not the same thing as a regular computer. It barely feels like a computer at all, in the same way that a phone is a phone in our minds, not a computer. Would something like this have a place in a library? We’d have to consider what it’s for. Because it’s not a generic computer that a patron could use for whatever they like, the purpose and use has to be crystal clear. Is it for browsing the collection? Is that a short-term activity, or a longer-term one? These computers are set up primarily for people who know what they’re looking for and want to find/order it. They even appear to be for people who have an item in hand and want to order a variation of it. It’s a very specific need that’s filled here. (You could browse the whole collection here as well, conceivably, but isn’t that better done at home sitting on the couch?) Libraries definitely have their specific-need patrons as well; reserve materials, textbooks, looking for a specific book or article. Is something like this helpful? We certainly have a lot of computers in libraries. 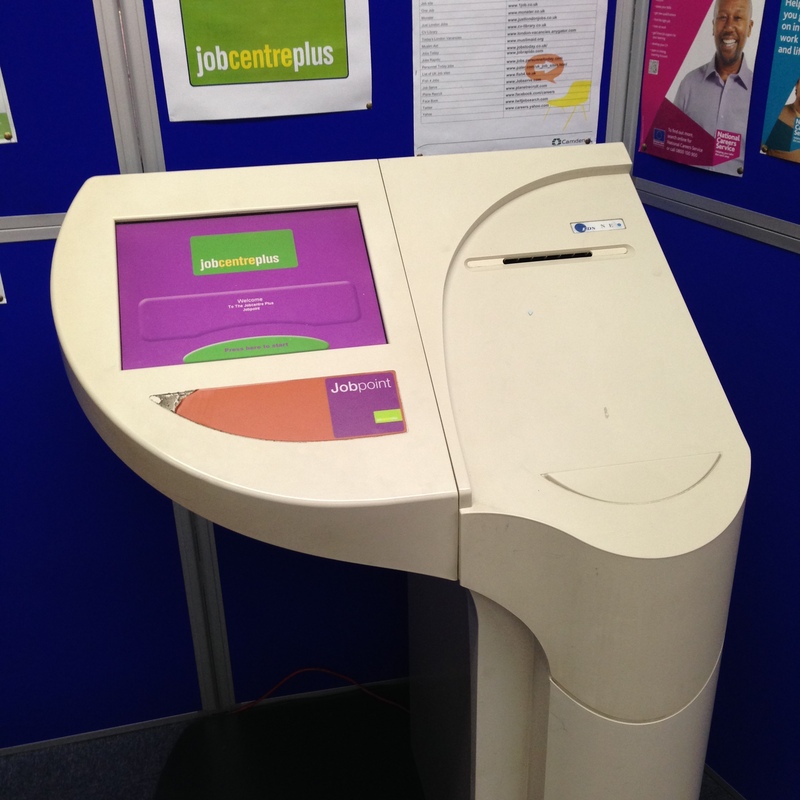 The way these ones are set up, they don’t let people convert them into email-checking machines. They’re single-purpose; browsing and ordering from the collection. That’s all. Though, when you think about it: it would be interesting if a device in a library could be a springboard off of I want something like this. 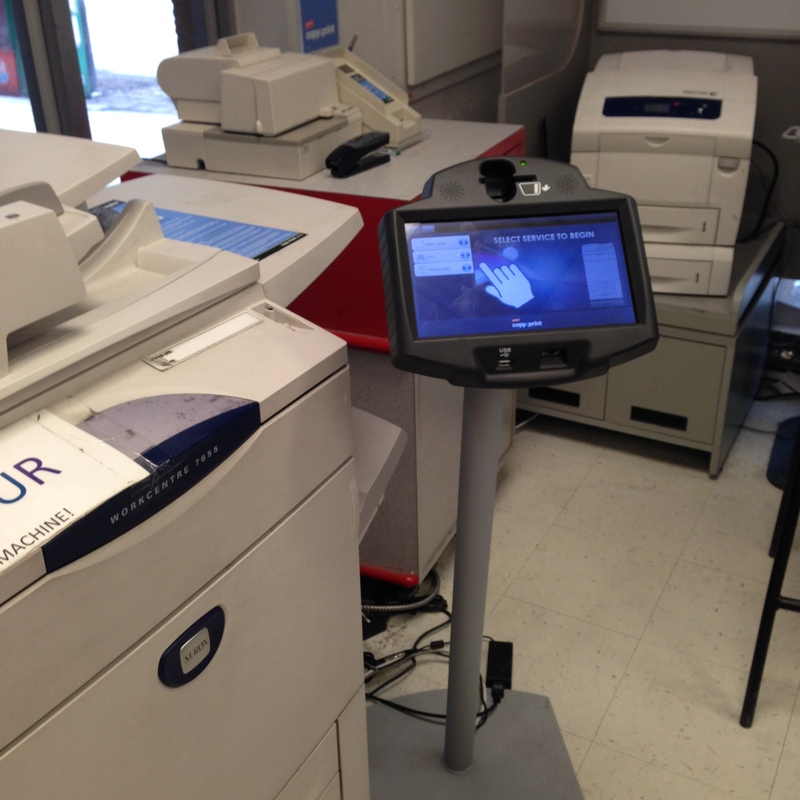 Scan a LC call number or a barcode and see everything in that narrow band for browsing. 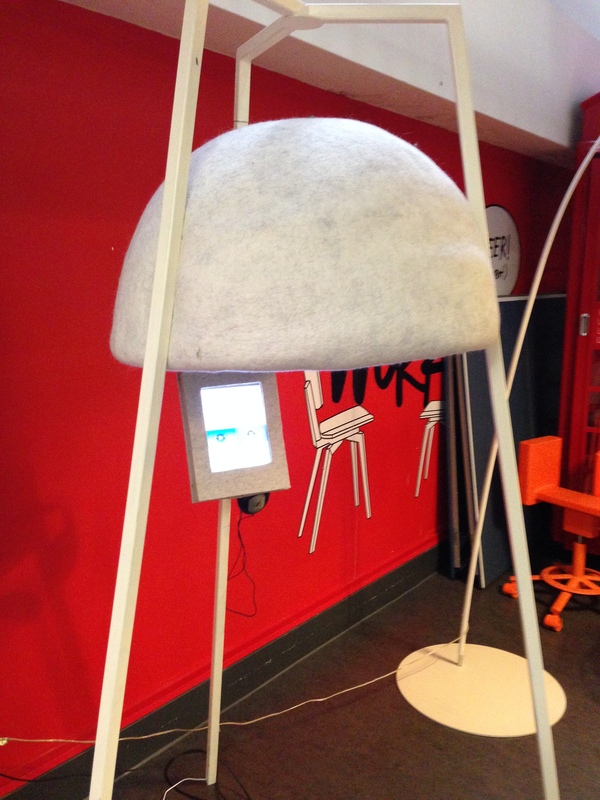 That might be a way to help incorporate our digital materials into a physical space. Physical books would then act as placeholders, the beginning of a journey into the physical and the digital at once. A reference collection could even double as the show collection, really (since it’s a miniature version). Patrons could bring their own books in, too. Or you could type in a title, I suppose, as you can do at these M&S terminals. It’s like a variation on a search term, like searching via photograph. Search via book metadata, without ever really knowing what that metadata is. I want more like this. That’s sort of interesting. It’s a cross-over between what can physically sit in a building and what’s available. I found this set up in M&S next to the underpants section. If you found a pair of underpants or a bra you liked but wasn’t in your size, you could order what you wanted directly from the computers here. It’s hard to say where that’s heading, really. Will people go for that? Will they eventually discover that they can do without the physical analogue as a starting point? (It seems, largely, that that’s what’s happening: online shopping statistics seem to go up and up and up every year.) What’s the future of shops like this? At the moment, this department store is still pretty crowded, and these digital ports were untouched while I was there. I’m not entirely sure it’s found it’s niche in this case. But I didn’t get to see it in use with a member of the staff. It might be that they walk customers through this when they have their heart set on something that isn’t in stock. These two kinds of computing stations is, it seems to me, a physical manifestation of where we are at the moment when it comes to computing; the keyboard and mouse are slowly being replaced by something slicker, but not everyone’s entirely ready for it. 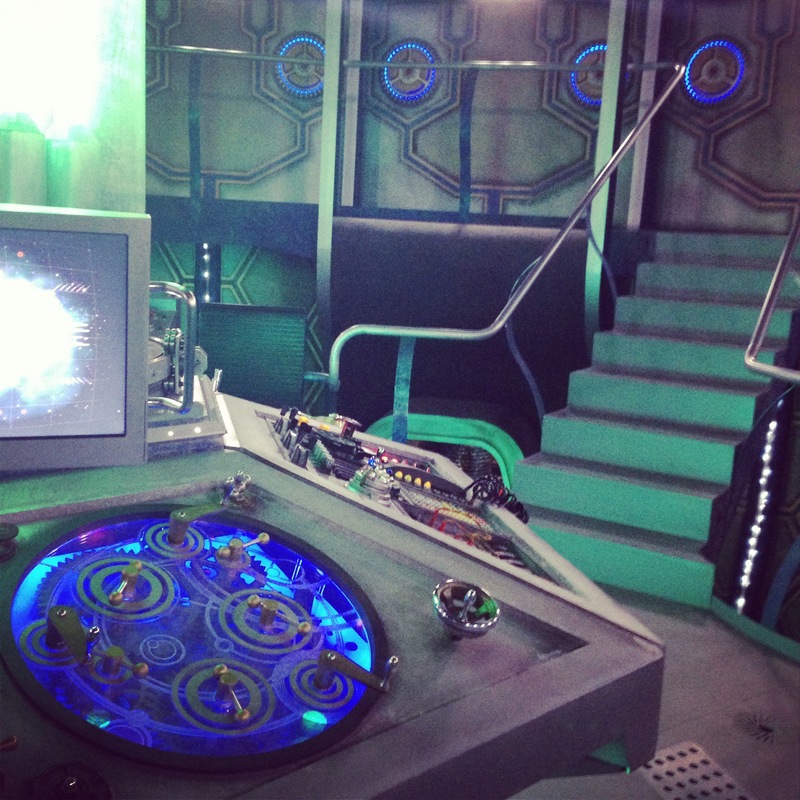 In fact, most people aren’t; look at the signage over the standard monitor. It looks as if they put the fancy iphone-like devices in, but people kept drifting toward the keyboard and mouse instead. 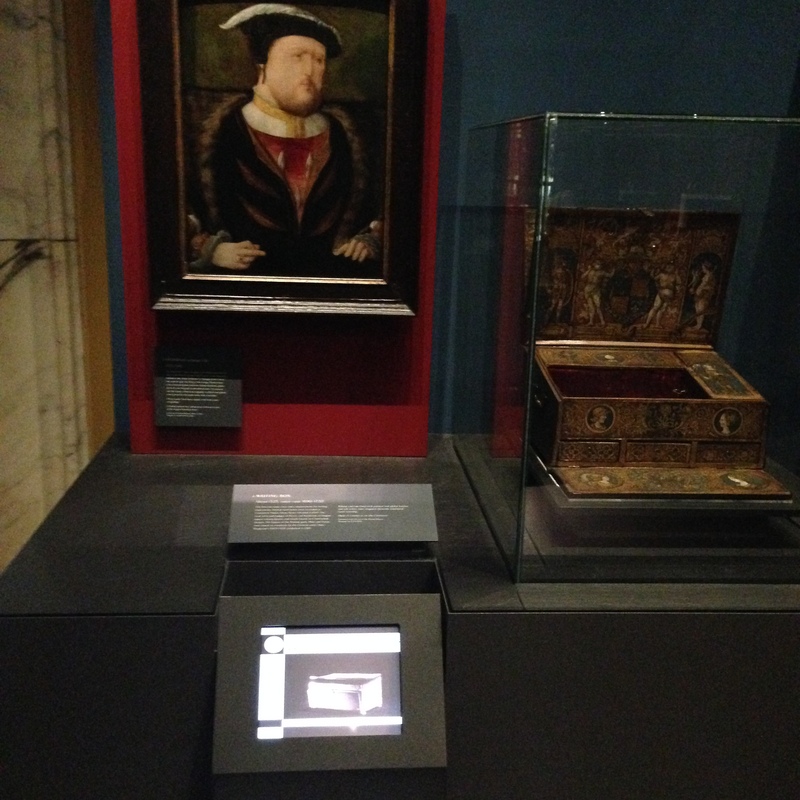 So they had to highlight that you can get the same content from the computers on either side as well! When the first laptop came out without a floppy drive, it hurt, because floppy drives were still in use. But eventually no computer had one anymore. This feels like one of those moments. The keyboard-and-mouse metaphor, which is frankly quite difficult to understand since both are proxies (press a button to create a letter that builds words, move an object to move a arrow that stands in your finger), is so comfortable and familiar to us that we often prefer it even though it’s far more primitive. But I suspect that will ease off as we fall more and more in love with our smartphones. I think dressing that touchscreen up as a smartphone was a good idea, as it helps replace that keyboard metaphor with something equally ground into our consciousness. I think commercial experiments like this have a lot of teach us in libraries. I’m going to keep my eyes open for more of these. I was going to call this “reference desks,” but enough of the libraries I’ve visited have disposed of the phrase, and I don’t want to re-apply it. This is a key element of any library space, in my mind, and is something widely and diversely interpreted. 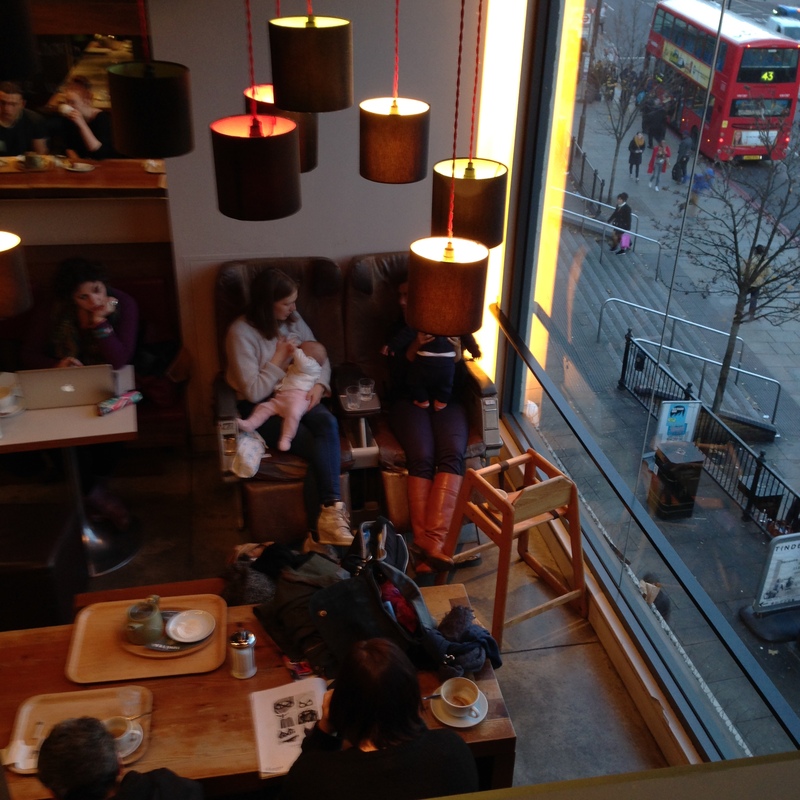 There is the back and forth between being big and obvious (in terms of furniture) and being as unobtrusive as possible. Look at this one! 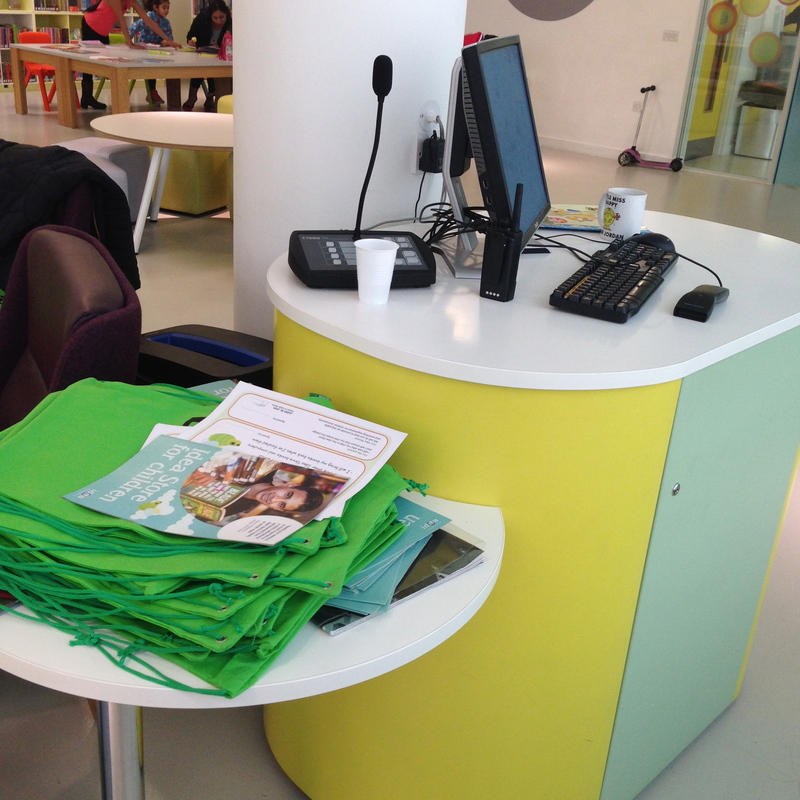 This is a “branch” help desk on an upper floor of the five-storey Idea Store Whitechapel. It closes up when not staffed. 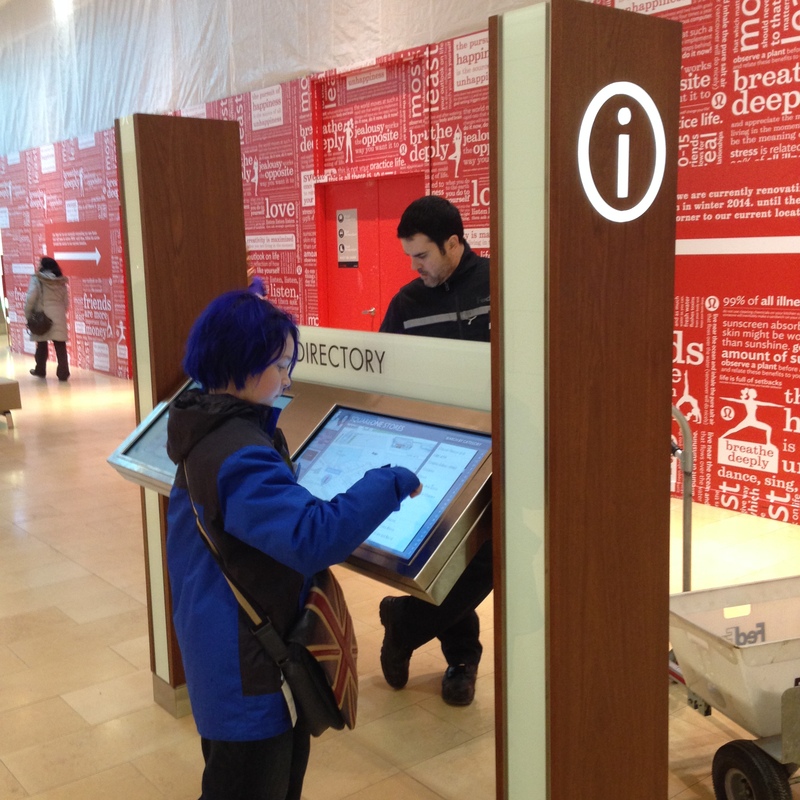 The Idea Stores can afford to have smaller furniture for staffed points for one big reason: the staff wear a uniform. As you can see, this staff member (who was so friendly and helpful, as well as very well-informed about the history of mission of Idea Stores generally, and articulate about it, which indicates lots of good strategic communication with staff from the leadership) is wearing a branded sweatshirt and a name tag. I didn’t question whether he was an employee on sight, regardless of the temporary look of this help point. In case it’s not clear, this is a computer in a lockable closet. 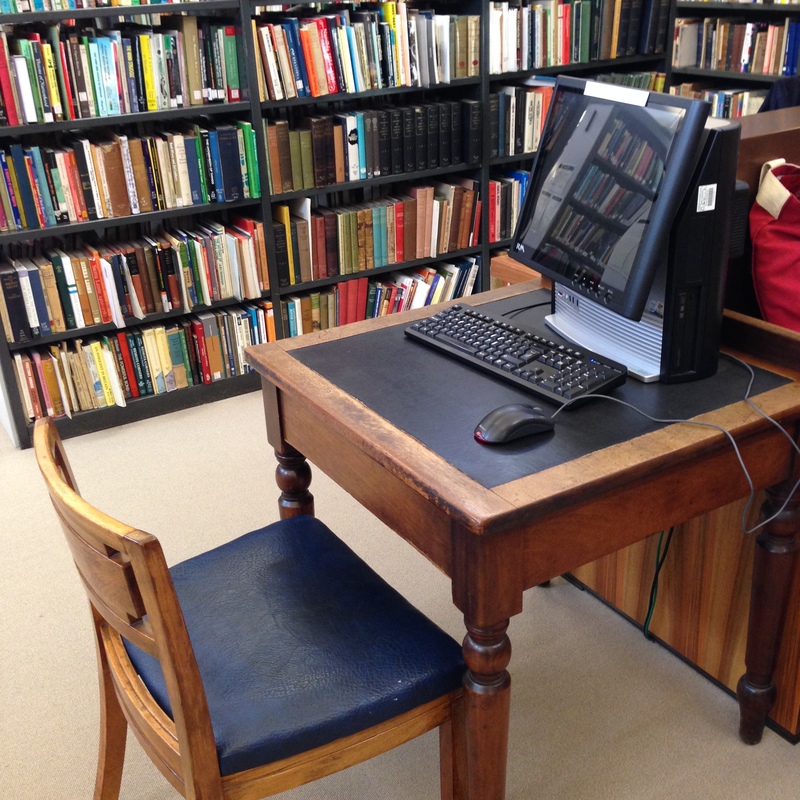 I’ve seen this kind of thing as the “instant office” plugged by places like Ikea for better uses of limited space, but I’ve never seen one in a library before. 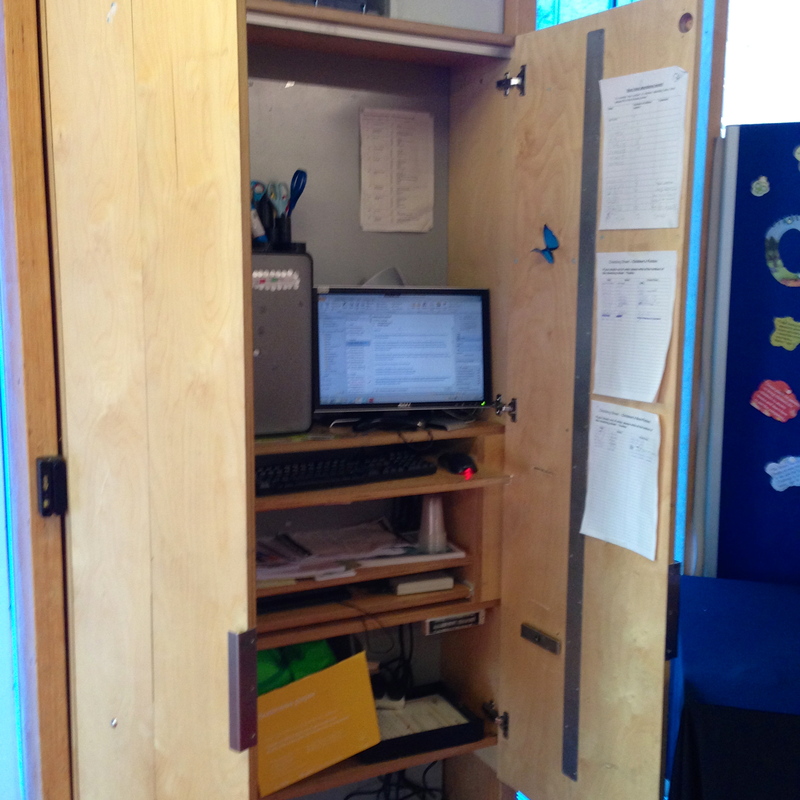 As it turns out, these closet staff computing stations exist on all floors of the library. I saw another, closed, up on the top floor near the cafe as well. I presume the idea is that you pull it open when the need arises, but leave it shut otherwise. It’s more of a desk than they have a Whitechapel, but not by much. The staff at this branch (also extremely helpful) might have thought I was visiting specifically to check out this particular desk, had lots of feedback for me about it. It didn’t have enough storage, for one. “Storage for what?” I asked her. All of this is very telling to me about what we think a desk like this is for. This is a recently-qualified librarian perched on the stool at her help point in the “Surfing Space” at Watney Market Idea Store. 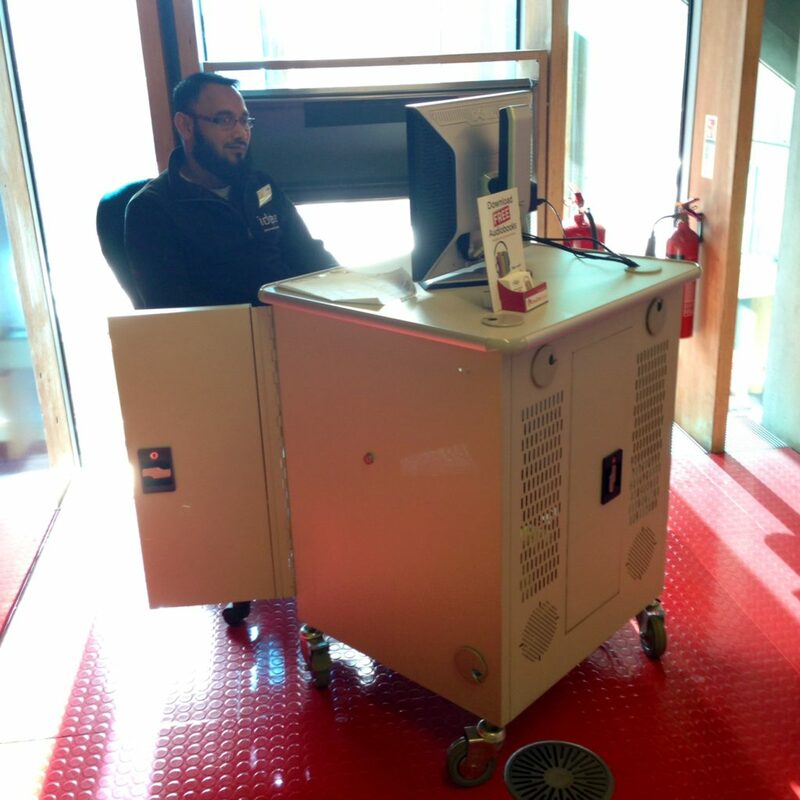 They are, as you can see, small workstations that don’t encourage the staff to sit and scroll through the internet when bored. They aren’t designed for comfort. They are, in essence, quick look-up stations, for 5-10 minutes of computing at a time, not office areas with lots of desk space to spread out. Nor are they collaborative in any way. 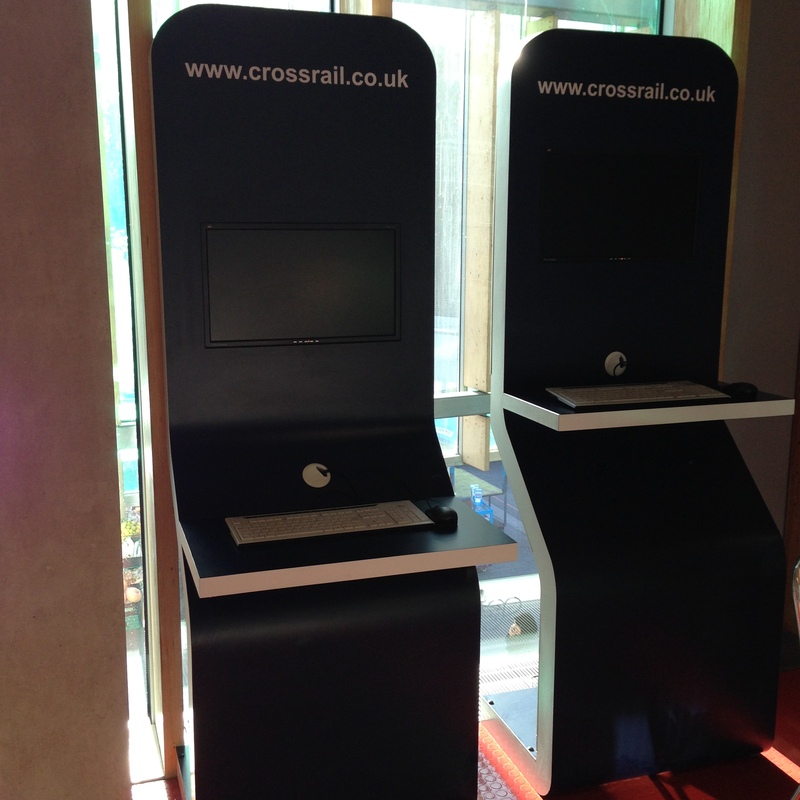 They are tools to help staff interact with the things staff have access to, in order to help patrons. The presumption of these spaces is that the real value in the interaction is going to happen between two people, with no real support from computing. Okay, this isn’t a great picture to illustrate my point. 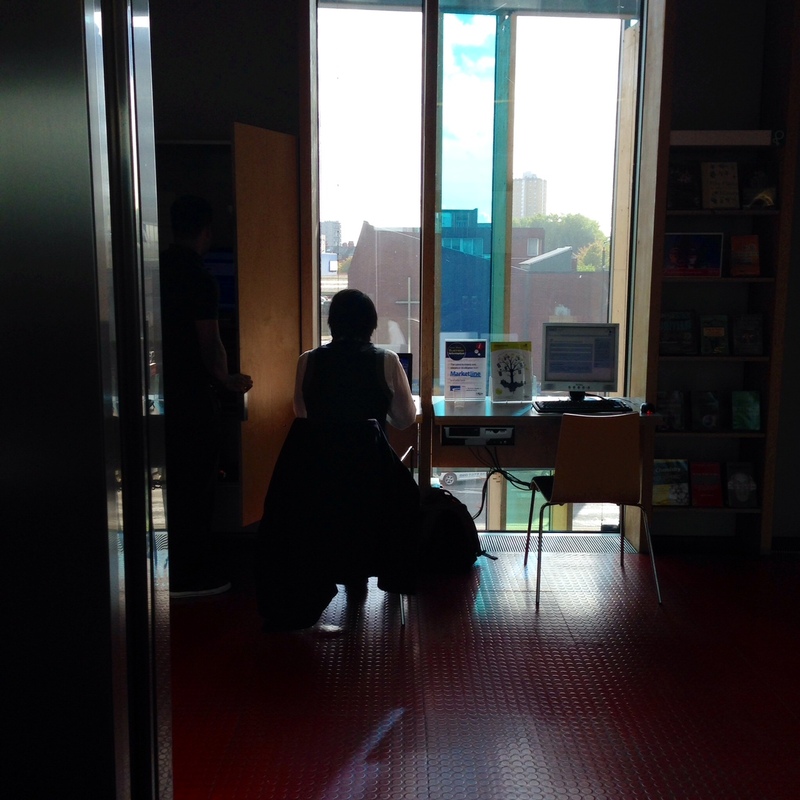 This is from the Canada Water library, which I will talk about in more depth later. You may not actually see their reference desk in this picture, but it’s down the first set of stairs, and on the other side of the second set. See it? Same wood as everything else. It’s a big, round, traditional reference desk. However, in a epic attempt to have your cow patty and eat it too, the policy at this library is for staff not to stand behind the desk. I understand the impulse: the furniture is there, it can be useful visually, but you don’t really want staff to stand behind it picking their noses and waiting for someone to need them. It’s a waste of resources and doesn’t look very good to the patrons. But if the staff aren’t behind it, the signal that this is the place where you can get help is kind of muted by it being unstaffed. Or staffed by someone who is hidden somewhere in the stacks or by the windows. As a profession, we have not solved the issue of computing, help, and desks. We have lots of ideas, and we know what’s wrong, but we’re not sure yet how to fix it. We’re at this very interesting juncture between recognizing the problem and finding the best solution, so there are an unlimited number of solutions in action, for better or for worse. All of the help points that I saw presume that technology is something the staff can use to help them answer questions, but is not critical to the enterprise. These are public libraries; that might have something to do with it (but I doubt it). 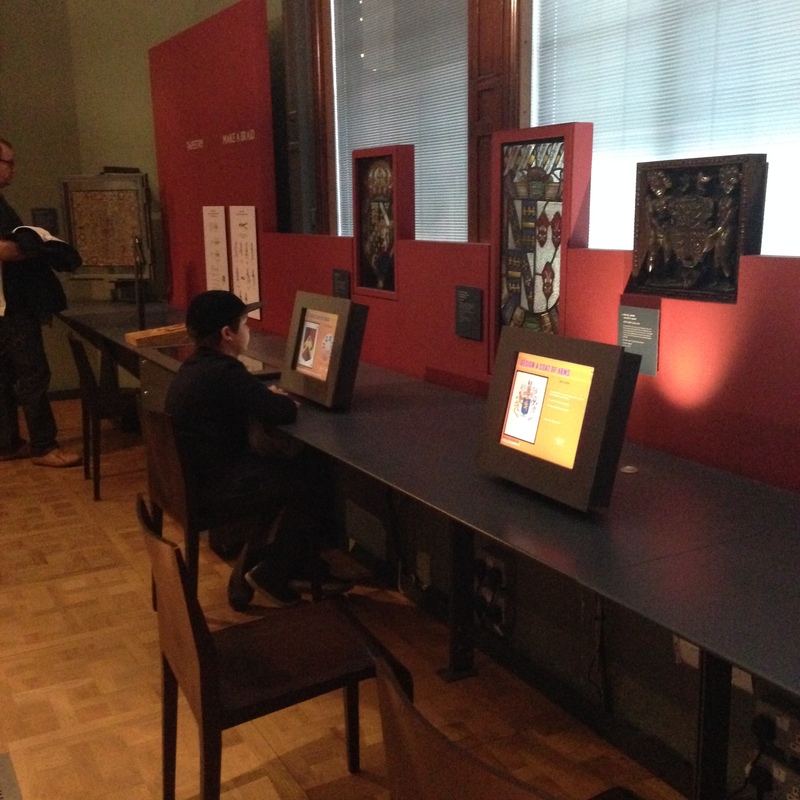 There is no sense in these spaces that help involves working together with computing. The furniture doesn’t allow it. Perhaps that’s not what they want. It’s easy for me to stand back and say, “I couldn’t do good work with this space.” Though that’s true: I would struggle to do good work in these spaces, because the kinds of questions I need to answer don’t involve a standing person coming up to me to ask a question I can answer without them sitting down with me, opening up their own computer or taking control of one of mine, and walking through a process together. We’re at odds with how to integrate computing comfortably, without alienating patrons, setting up de facto workstations where staff ignore patrons (or seem to be), or play solitaire all day. It’s a challenge, and our metaphors have largely failed us. The first step with any kind of space, any kind of application, service, or idea, has to be its core metaphor. We often don’t consider this, but everything has a metaphor, and that metaphor is what tells the user or patrons what that space, application, or service can do for them. A good metaphor helps people see the affordances of a thing so they can use it more naturally without having to dig for an instruction manual. My classic example of a watertight metaphor is email. If we called it server messages, that wouldn’t help anyone understand what they could do with it, but once you call it email, the metaphor does a lot of the explanatory work for us. You receive it email, send it, store it, throw it away. You get packages, you unwrap them. A tight metaphor can make the difference between an idea that soars and an idea that absolutely fails to catch on. Libraries come with their own ready-made metaphor; libraries are a metaphor. Other systems and services use the concept of a library to explain the idea that key resources are stored in a place they can access. An image library stores imagines in a browsable format, a seed library stores a wide variety of seeds and makes them available, that sort of thing. That metaphor is useful in many ways, but it also limits what we can do as libraries. People come into a library with many, many preconceived notions. But if you want to reinvent yourself, you have to either stretch the existing metaphor (tricky and often limiting) or create/borrow a new one. One of the metaphors that higher ed designers have been reaching for of late is “home.” What if the library is your home away from home? What if we designed spaces that looked more like your living room or your dining room? I’ve heard lots of arguments countering this direction, all of them perfectly fair. 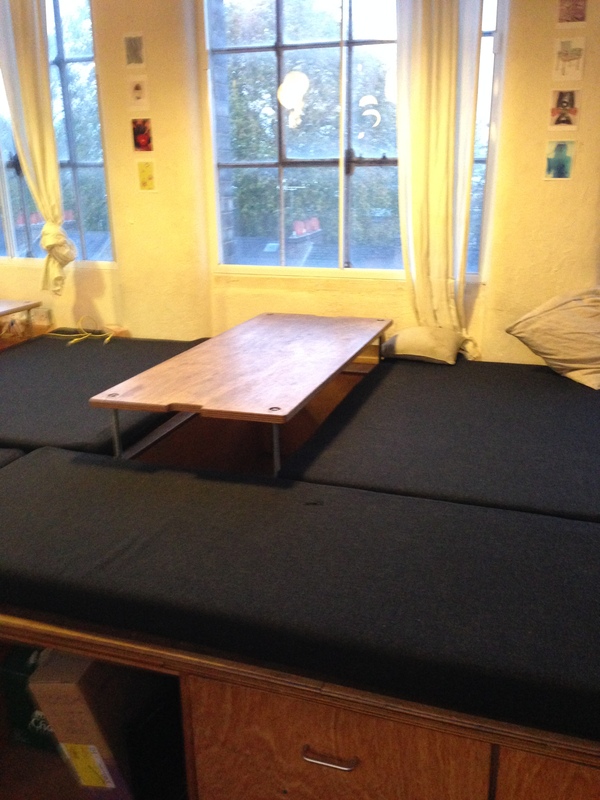 (Do we really want undergraduate students treating our library the way they treat their own living rooms? Probably not. Does it benefit the library to have a certain level or formality, even if it’s only a little bit of formality? Probably so.) That said, I still find this idea intriguing. 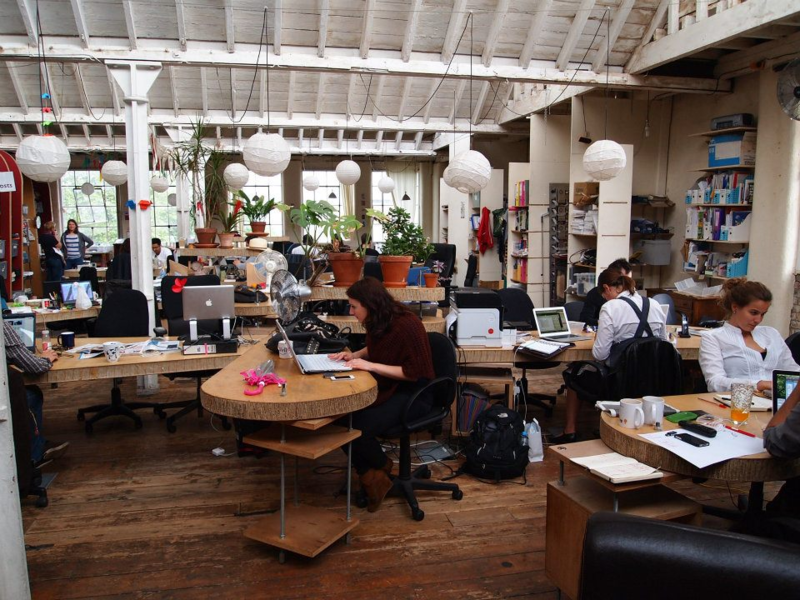 My colleague Lauren Di Monte and I have discussed this many times; what if we could have a space to work in that was designed more like a home than like an office? It’s all the rage with high tech companies like Google and Airbnb. The advantages of it for us, as employees, seem obvious: a comfortable chat around a dining room table is more pleasant and relaxed than a conference room. Who doesn’t love working in a sunny kitchen? There’s no single desk in places like that, you pick up and move based on your needs. 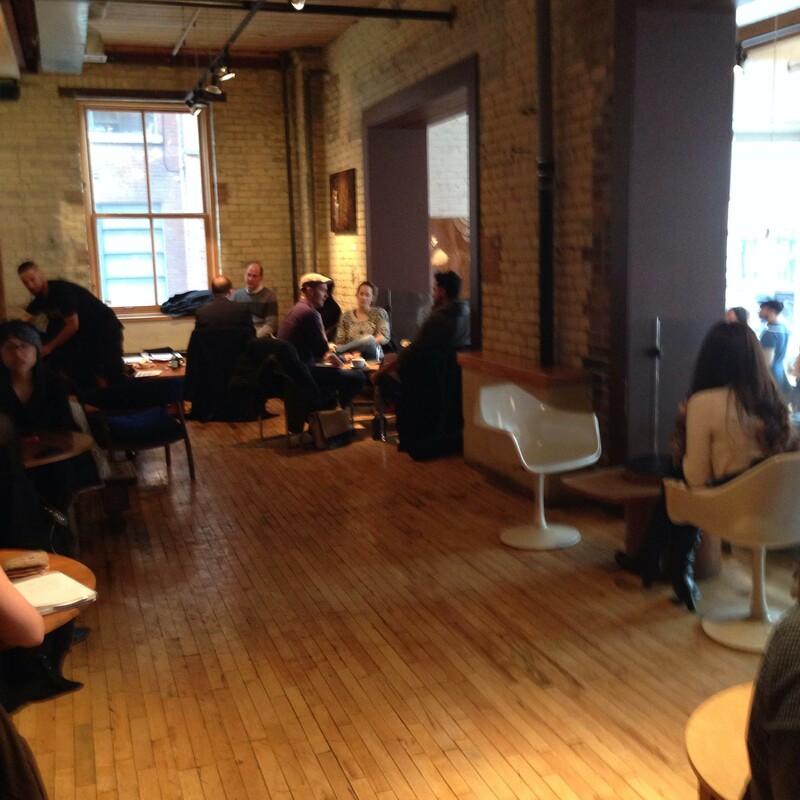 What if you hunker down and get work done in a place that looks like a living room instead of in a cubicle? 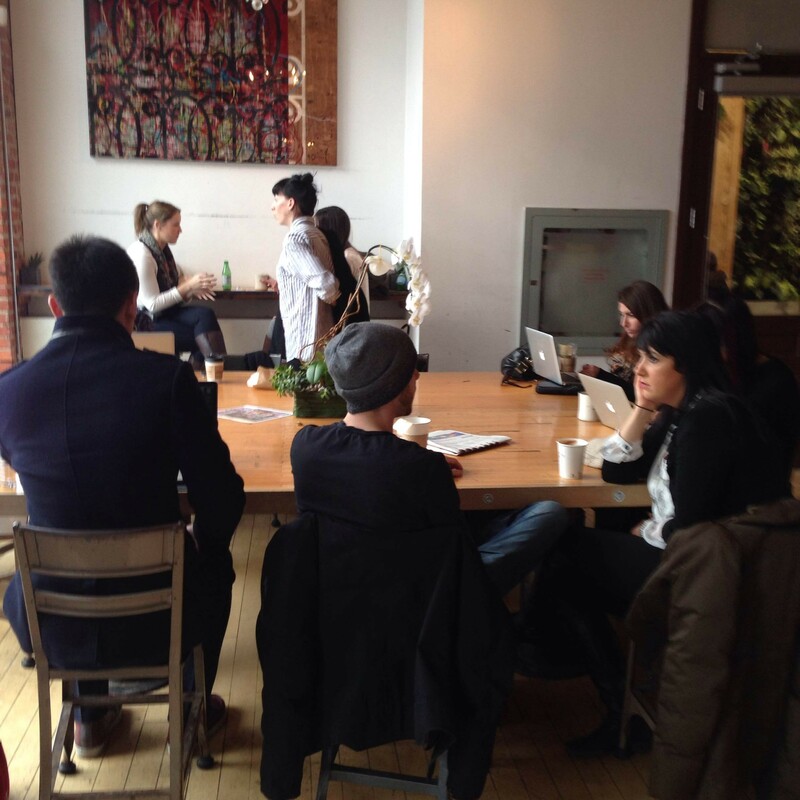 Those kinds of spaces, it seems to me, lend themselves better to facilitating real collaboration. It doesn’t let you dig into your space and never come out. It forces you to tailor your location to your need. 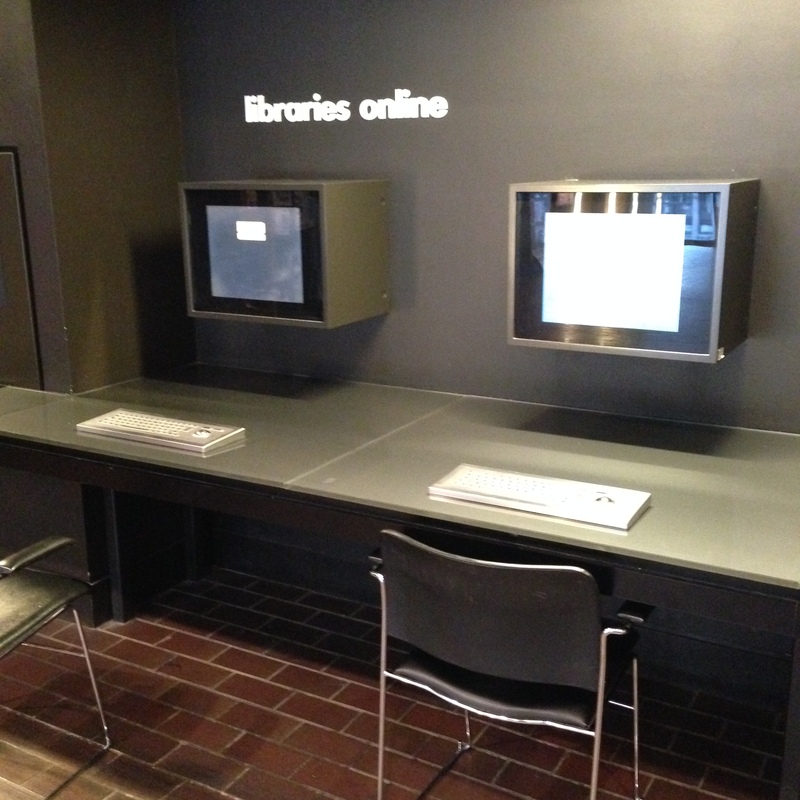 The Idea Stores of Tower Hamlets, London, have taken this concept more to heart than any library I’ve ever seen. And to be clear: Idea Stores aren’t just libraries. They are libraries, they are definitely libraries, but they also offer courses and provide space for civic information needs and rentable interview rooms for local businesses, among other things. Idea Stores are what happen when you take a library, shake it out, and reconstruct it based on patron needs rather than tradition. The metaphor you’d expect (as a North American) is retail, given the name. It’s an Idea Store, do you buy ideas there? Seems logical to my Canadian brain. But this is the UK, and they call their stores shops here. So it’s not an Idea Shop, it’s a Store of Ideas. A variation on the idea of “Library”, without all the connotations people bring to that word. Names and metaphors are cultural and specific, obviously. Idea Store Whitechapel went with a home metaphor. They want their patrons to feel at home there. I really like this approach, for one giant reason: the longer I’ve been in librarianship, the more I’ve become aware of the fact that the #1 enemy of learning is fear. Everyone’s afraid. They’re afraid of failure, of looking stupid, their afraid of technology. This is the way we live our lives, it seems: battling fear. If you decide that your key goal in relation to your patrons is to first address fear, you can, in my experience, watch them go much further if you ignore their fear and consider them information-needy instead. Entirely different approach! I think the “home” metaphor, with all it’s dangers, is another way to address that core fear. 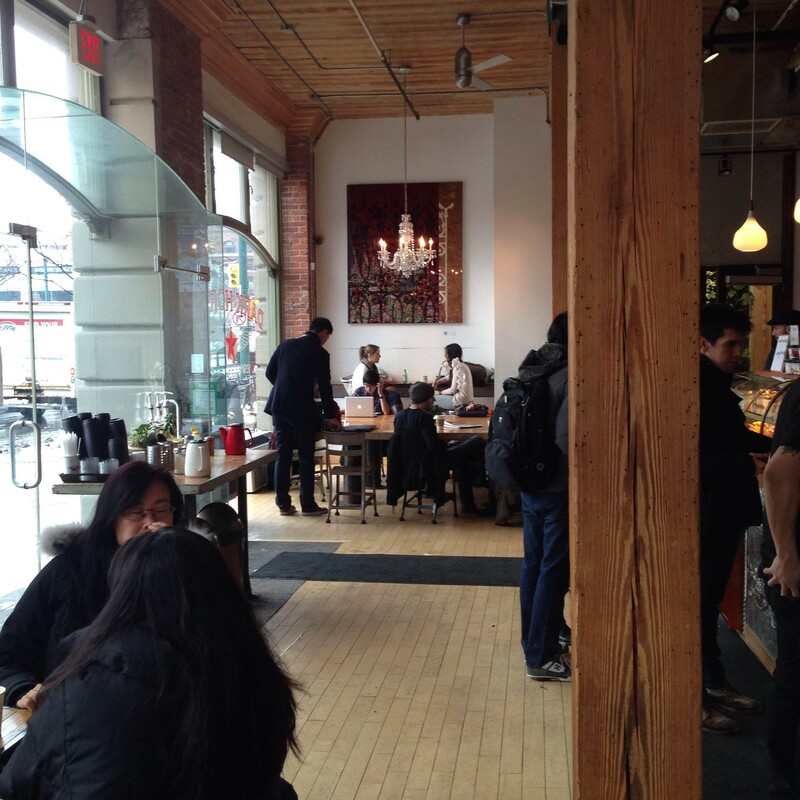 If a place feels homey, that’s one step closer to opening patrons up to new ideas. 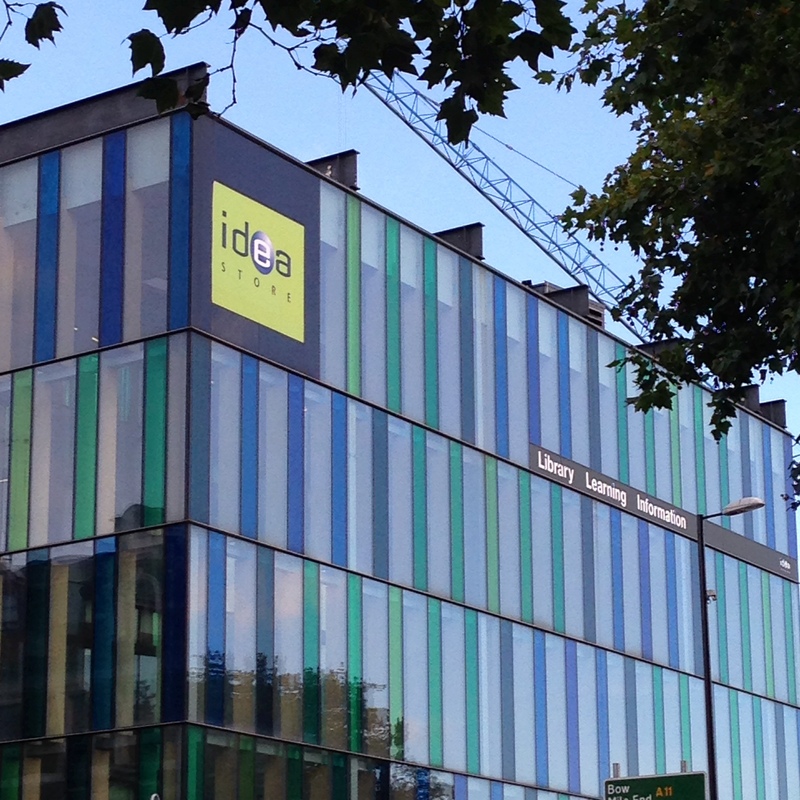 Idea Store Whitechapel is at once a little industrial in feel and also very approachably homey. The lighting is lower and dimmer, and the furniture is the same sort of thing you’d buy for your house. But it’s got an industrial-style flooring and exposed wooden beams. It’s not a perfect “home” replica, but the hints are there that it’s not your average library. 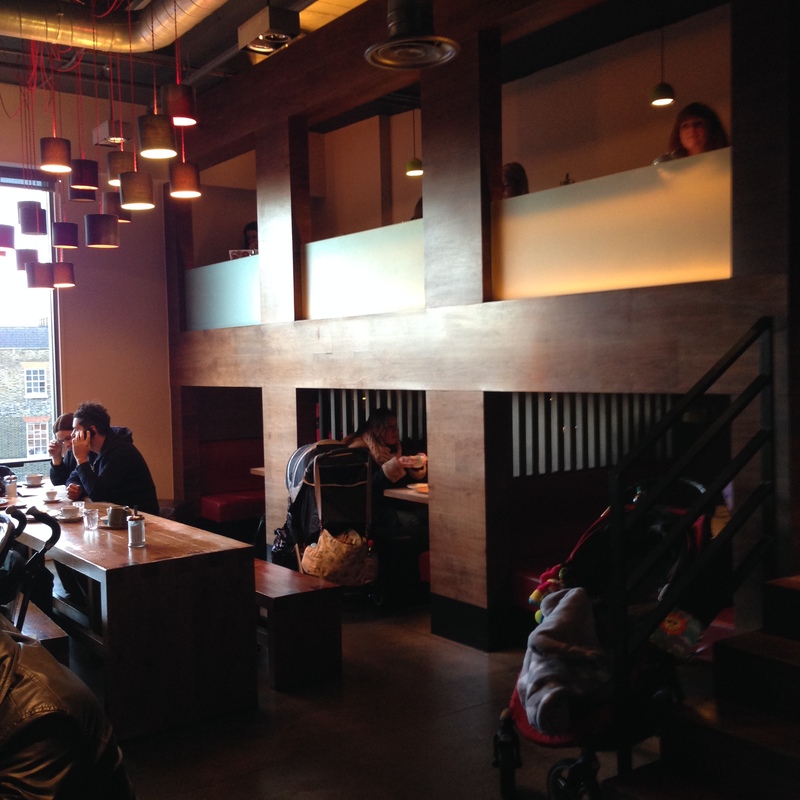 Up on the top floor, with a really lovely view of Whitechapel and the Gherkin in the distance, they have a cafe. 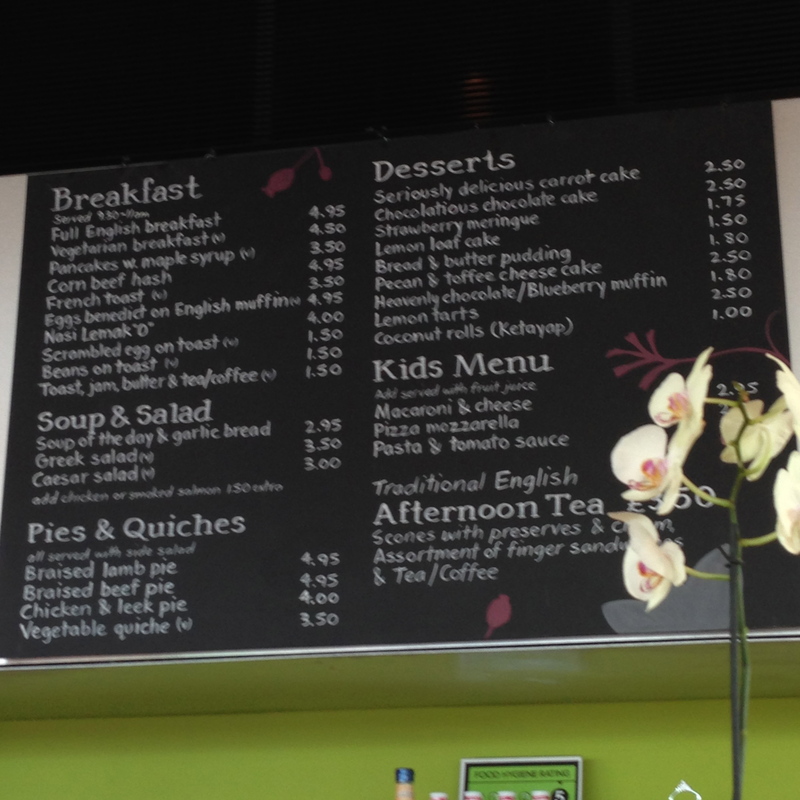 Not just a Starbucks like we have at home, but a actual cafe, where, until 11:30, you can get a full English Breakfast. I asked about their food policy, in case you were curious: no hot food in the rest of the library, but snacks are okay. 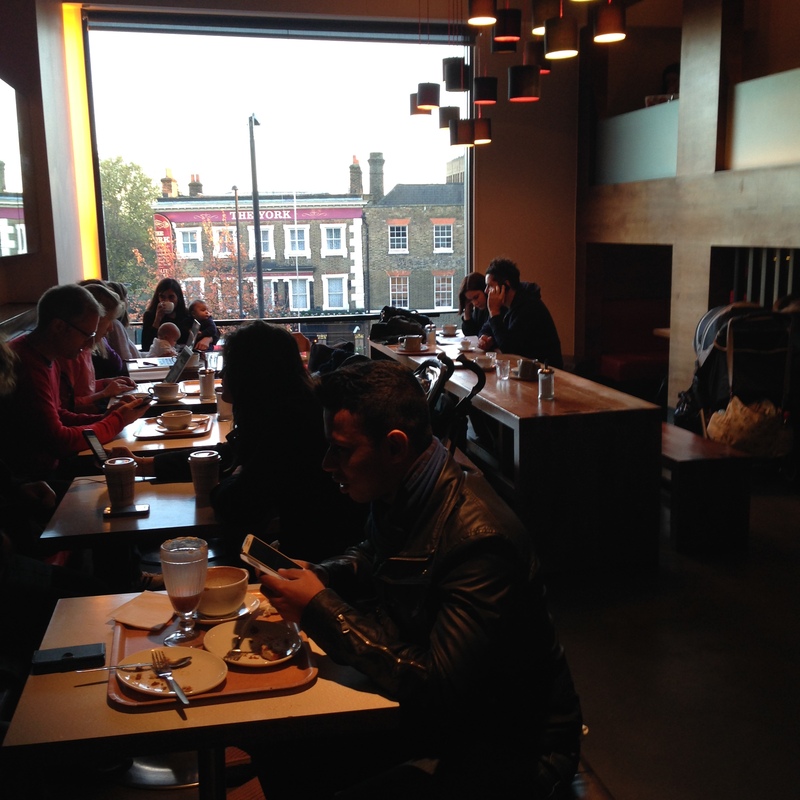 And in the cafe, along with the cafe tables where people are eating? The most recent issues of magazines and newspapers, of course. So we have a kitchen and a dining room, and what’s next to that? A living room, with a big television. It’s got a viewing schedule as well, so you know what you’re in for when you sit down (they take requests). But it’s up on the top floor, where you need to at least acknowledge, at some point or other, that there are four floors of resources and services beneath you you might want to think about. We always put the cafe area up front, but I can see the upside of moving it to the top floor. You can’t smell the kitchen anywhere else in the library (unlike at the Canada Water library, which is a story for another post), you lure people up, just like they do in commercial settings, and you get a terrific view. I think the volume of traffic through the Whitechapel branch is telling of the success of its choices. 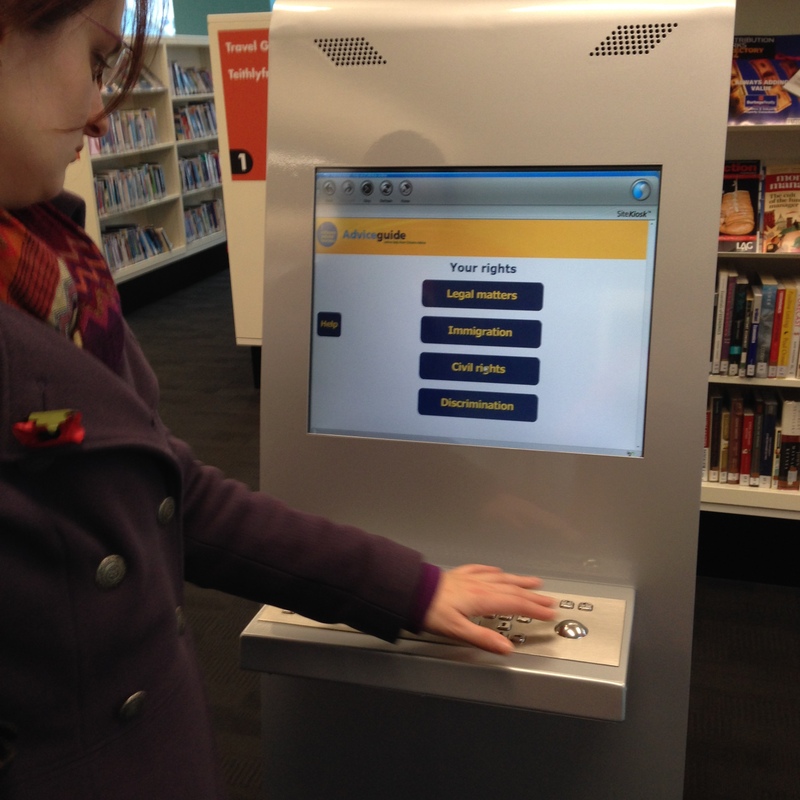 I visited two more libraries today, and neither was as packed as Idea Store Whitechapel. Nor were the activities going on inside as diverse; I saw groups of men chatting at tables, groups of women chatting at tables, young adults studying, lots of women with babies. It really is their second home, and I think, in this context, that’s a good thing. Just as I finished writing about the downsides of casters, I see an addendum about casters. A collection on casters! 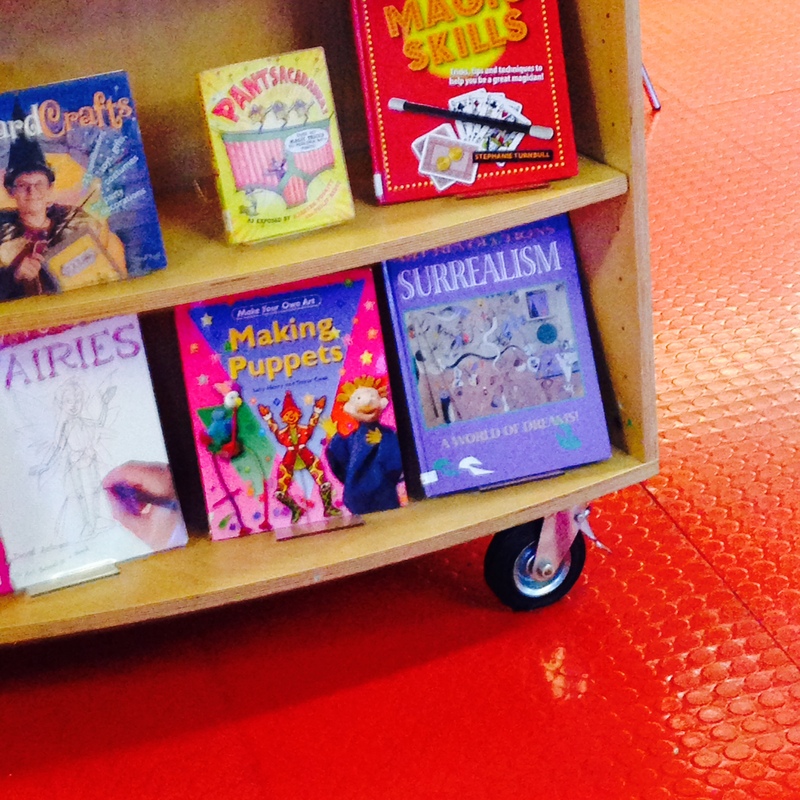 This is in the children’s library in the Idea Store Whitechapel. (More on Idea Store, and the Whitechapel one in particular, shortly.) While I’m not that fond of casters generally, I have to say, this puts a new spin on the idea of mobile shelving. Mary Ann Mavrinac always said the goal of good library design is people space over collection space, and this is another example of that ethos. When people need it to, the collection slides out of the way.